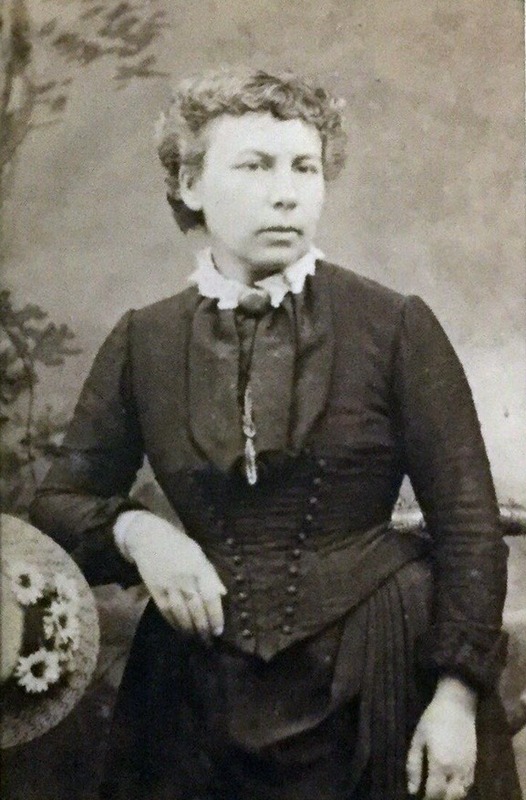 “ I give to my wife, Margaret Edwards the House that was her Fathers`, Samuel Cornelius for her natural life only and after her death to my Daughter, Dinah Edwards". This was a revelation as in that sentence was the clue to its early history. For I knew from the Land Taxes that William Edwards had a substantial property in the village and after his death in 1767, his wife, Elizabeth is shown briefly as owner, but then I lost track. But with Parish Records and other information was able to build up a family tree linking the various families to the Edwards. It would seem that the building is indeed associated with the family called Cornelius. Their earliest reference is in 1641, when Alexander Cornelius appears on the Protestation List for the village. 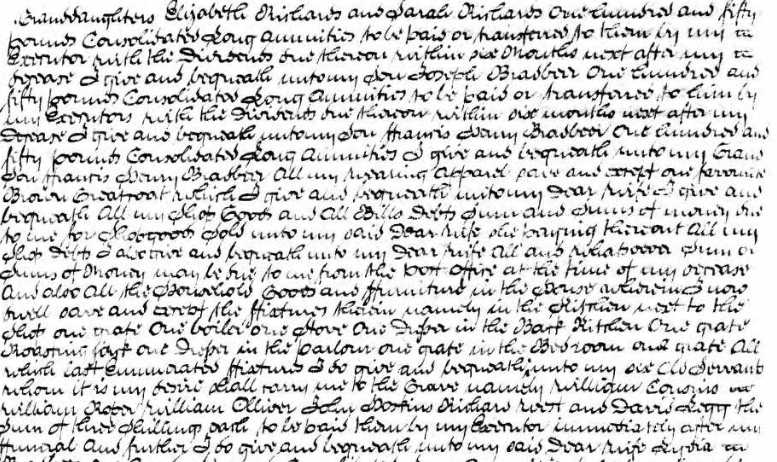 His son Samuel is born in 1672 and the Parish Records show him marrying Mary Street in 1706. The following year a daughter, Margaret is born to them. Margaret Cornelius goes on to marry William Edwards in 1739 and they have a large family. On the death of her father, Samuel, in 1745, Margaret inherits the family house. She brings up her family there with her husband, William. This is the house that is referred to in the Will, and on her death in 1784, it had indeed been inherited by her daughter Dinah, who was married to an Excise Officer from Dalwood in Devon, with the unusual name of Crout, which appears in the record books. They were to have two children, Robert and Elizabeth. It was the latter in 1799 who was to inherit the property on the death of her father - Robert. Two years later she married the twenty three year old Francis Bradbeer. He was the son of Joseph Bradbeer, who had originally come from Blandford Forum and was for a number of years the Landlord of “ The Three Crowns ” opposite. It would seem that there was to follow a devastating set of events. In 1804 tragedy struck the family when Joseph lost his Wife Mary, his daughter Maria Richards as well as her husband. The following year it was to be his son Francis, who was to mourn the loss of his wife, Elizabeth. As a result he decided to make a fresh start and moved to Woolwich to join his brother, Joseph jnr. who was based there in the Artillery. 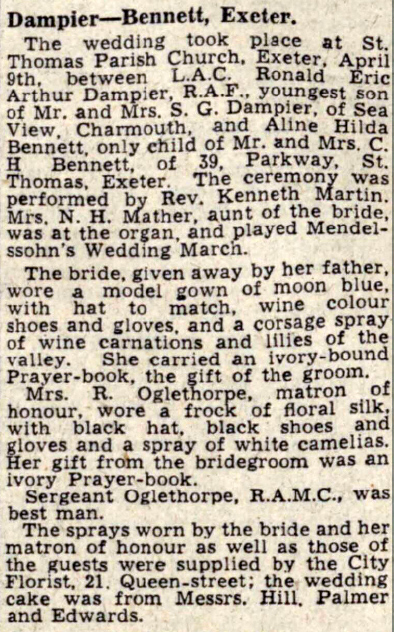 He was to re-marry shortly after and open a Tailors shop there before moving with his family to Salisbury. It is his father ' s name,Joseph that now appears in the Poor Rates Lists. 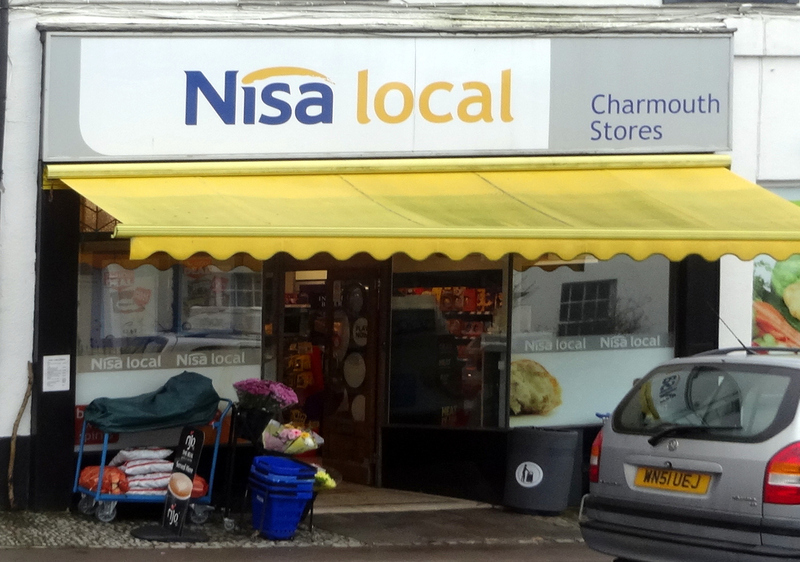 They show that the property was in two parts at that time and what is the Charmouth Stores (Nisa) formed the smaller area and the other part was let separately. In 1806 it is shown that Mr. Osborne occupies this part, but more importantly the other section was to be the Post Office and Store which Joseph Bradbeer was to open in that year, the start of over 200 years of trading from the same site. Indeed, some of the original building is incorporated today in the rear of the property. This was to be a momentous year, for he is to marry his third wife, Lydia Margrie who is 25 years younger and together they run the Post Office and Store. He is still renting the Three Crowns from William Edwards but soon after gives up the lease after 20 years as landlord there. The Royal Mail would pass through the village each day and stop briefly at the Inn. The letters would have special hand stamps, some of these letters have survived from this time. 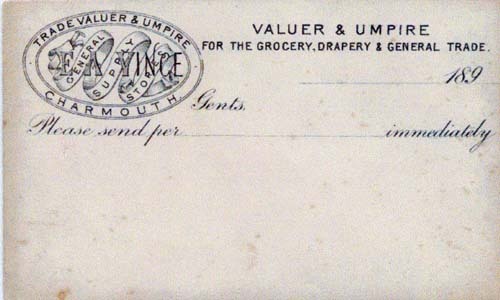 Until the Penny Black appeared in 1840, People would often refuse letters as they would have to pay on receipt, unless prepaid. 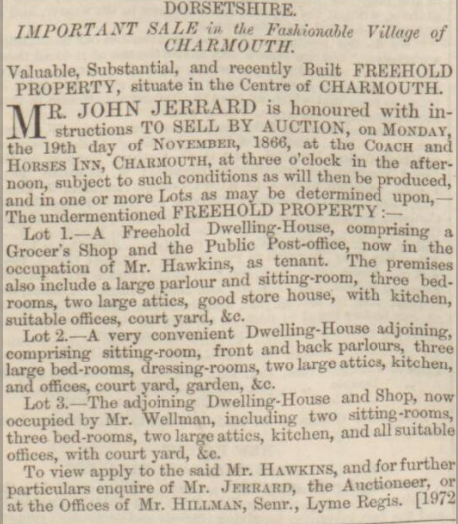 This is shown by an advert in the Western Gazette in the year 1809 which mentions the Charmouth Post Office as the forwarding address for a property to let by a Mr. Jerson, who makes it clear that “ only post-paid letters will be attended to ” . A Census for the village in 1812, describes Thomas Browning, who occupies the west part of the building as a “ Coach Man ” and Joseph Bradbeer, who is in the east part as a “ Post Master ” . On his death in 1821 at the age of 71 he leaves his estate to his wife, Lydia, which includes a small cottage that used to stand in the grounds of the church and was at one time Stables for the Manor House opposite. She continues running the shop and letting the other part and its stables. It is interesting seeing Thomas Galpin Carter renting part, as he was the Artist for many of the early images and prints of the area. She is later described as a Shopkeeper in the General Post Office Record Book when she takes on the role of Post Mistress. 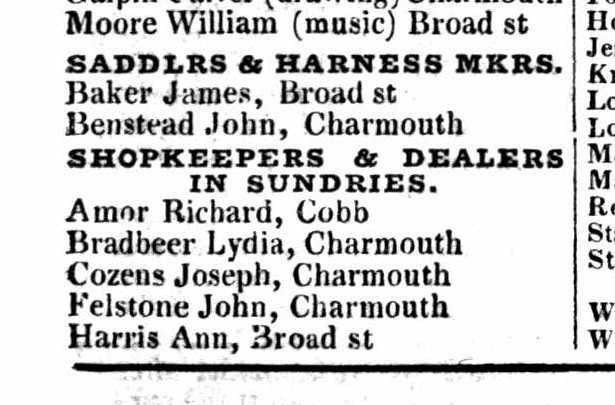 The Pigot`s Directory for 1830 lists her as a Shopkeeper and dealer in Sundries. Her life is to change again in 1832, when at the age of 57 she marries the local school teacher, William Dodson Watts. In the same year, she lets the western part of Prospect Place to John Carter, who is a Carpenter, with a workshop in the building which houses “ The Pharmacy ” today. He later opens a shop in his part of Prospect Place. Unfortunately Lydia`s marriage is a disaster and her husband a spendthrift soon gets through her legacy. There is a reference to William Watts being dismissed by the Post Office in 1839 and John Carter, Grocer becomes the Post master. William finally leaves Lydia and she has to sell all her property to clear his debts. I have been fortunate to locate the advert for the Auction in May 1841, which describes the lots in detail. She even loses the freehold of her shop where she is living when it is bought by the wealthy Wootton Fitzpaine Farmer, Benjamin Swaffield. Lydia later moves her busines across to the small cottage that once stood in front of the church, where she stays until selling her interest in 1860 to the trustees, who demolish it to extend their yard. Sadly she loses her eyesight and dies a pauper at the age 89, six years later. 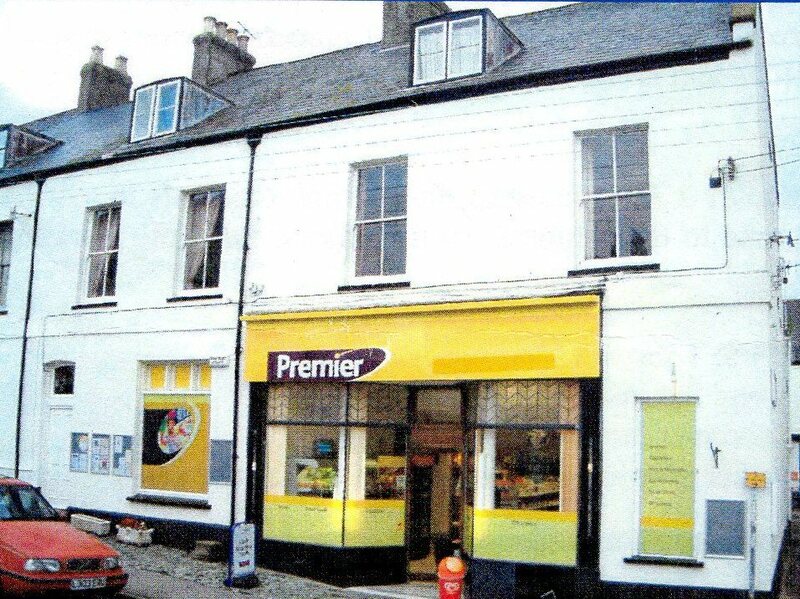 The auction of 1841 gives some of the tenants the opportunity to buy their premises, and both Giles Pryer and John Carter become freehold owners and prosper. But in 1864 there is a devastating fire that sweeps through the building and almost destroys the surrounding properties as well. The newspaper ' s report at the time are quite descriptive about the thatched roof and how after initially being put out by the Lyme Regis Fire Engine, the fire returned the following day, even more destructive. It is rebuilt in brick and tiles by Giles Pryer who divides it into four units which are named: Charmouth Stores, Ashyford House, Rupert House and Stanley House. They are numbered 1 to 4 Prospect Place and I have endeavoured below to provide a potted history. This was to be a Post Office as well as a Stores for its first hundred years and was one of the earliest in the country. For the Royal Mail as we know it today was initiated by John Palmer of Bath in 1787 with its first fast service from Bristol, via Bath to London. The following year he began running his coaches from Exeter to London and they would have passed through the village. The Three Crowns was to become a Coaching Inn, owned by William Edwards but run by Joseph Bradbeer from that time, for almost twenty years. The trade was so important that it was renamed “ The Mail Coach Inn ” and subsequently the “ Coach and Horses ” . He opened the Post Office in part of the present building in 1806, which due to a tragic chain of events already described was inherited by his son, Francis. 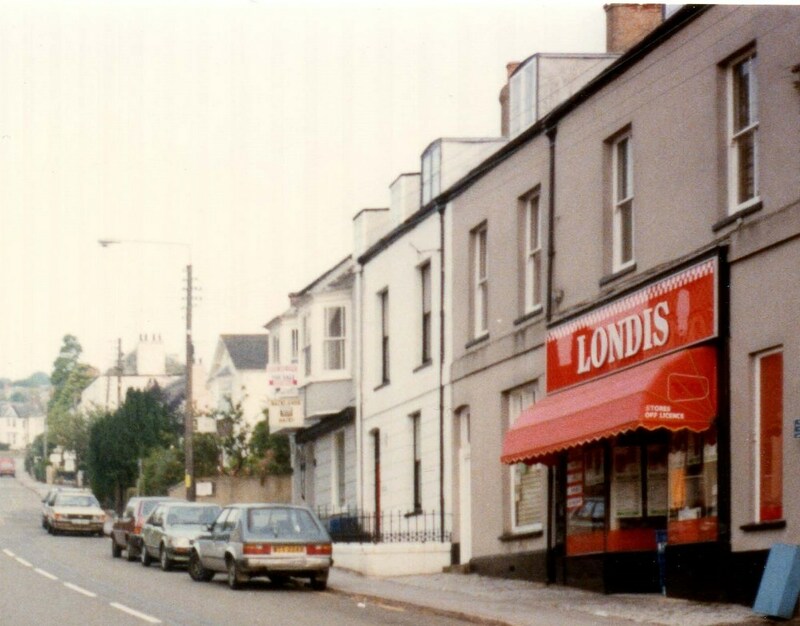 On Joseph`s death in 1821, the business continued with his wife, Lydia who rented part of the building to John Carter, who opened a shop there in 1832. After a disastrous second marriage to William Watts, she loses her properties, which are auctioned in 1841. 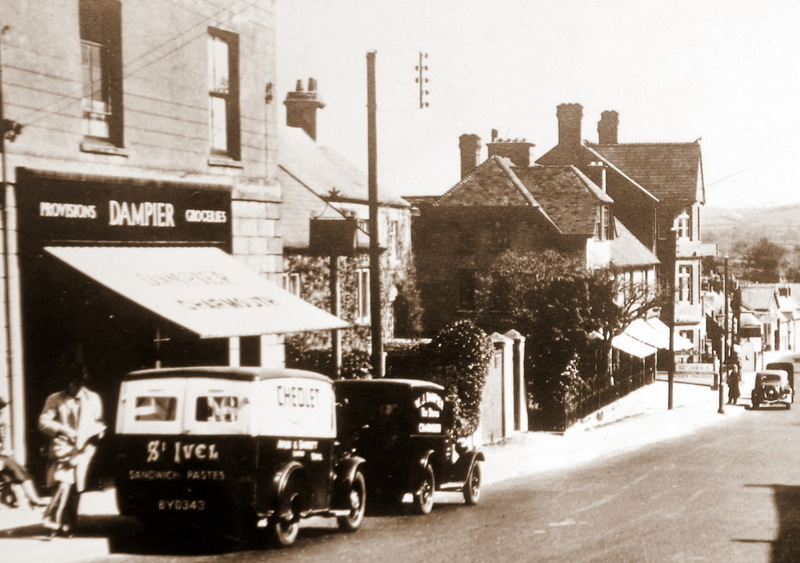 The Tithe Map and Census for the same year, show her, now single, running a shop in what is now Charmouth Stores, with John Carter taking over as Post Master, in the central section of the building. Directories of the time advertise the business as that of a Grocers, Post Office and Builders. 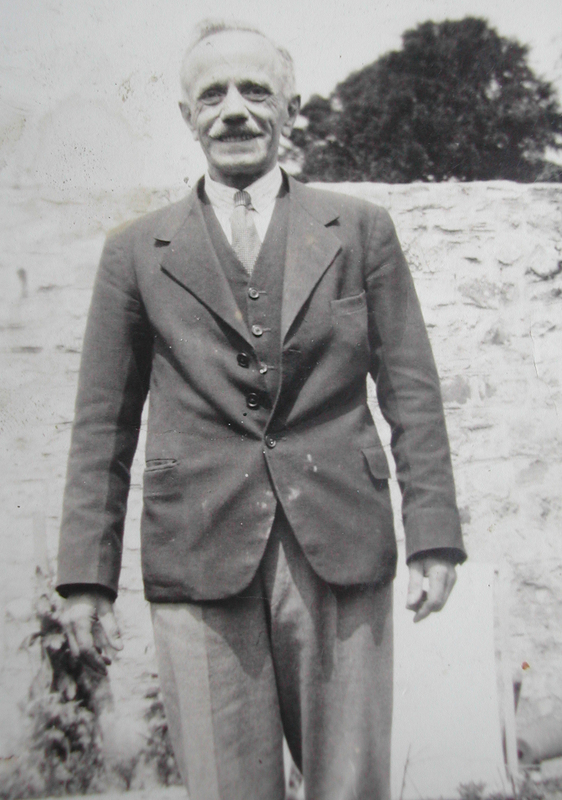 Sadly John was to die young in 1855 and leaves the shop, three houses in Catherston and a house in Sea Lane (Lower Sea Lane) to his wife who continues running the business with the son, John William (born 1841) who later takes it over. 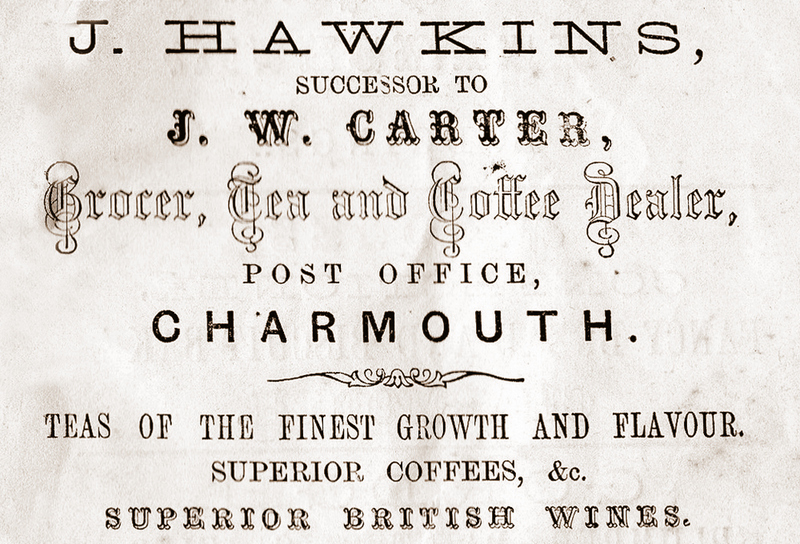 In 1862 the Post Office and Stores is in the hands of John Hawkins, who advertises: Teas of the Finest Growth and Flavour, Superior Coffee and Superior British Wines. He continues for a while, but by 1870 George Mortimer is the owner and is described as a Linen & Woollen Draper, Grocer, Tea Dealer & Provision Merchant, China, Glass, Earthenware & Brush Warehouse and Post Master. 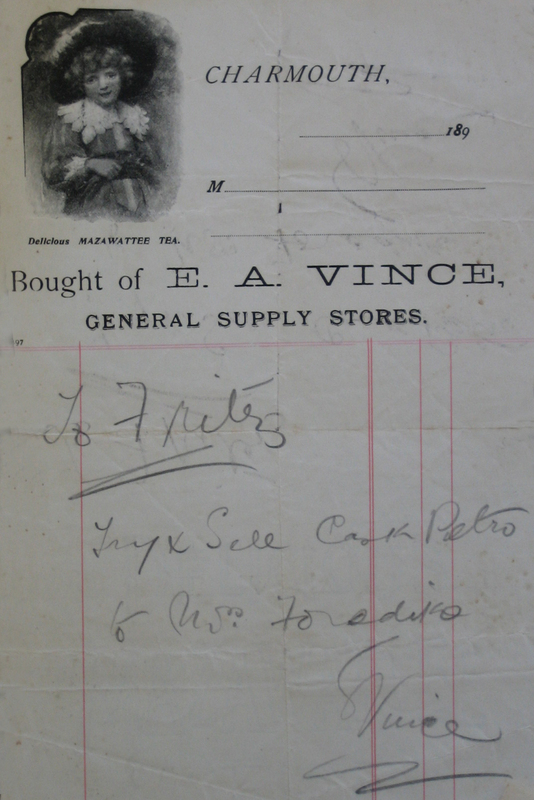 He eventually sells the business to Edward Archer Vince in 1888. Old Photos of the time show a massive hoarding on the side of the building with a long list of all the goods and services that were offered inside. 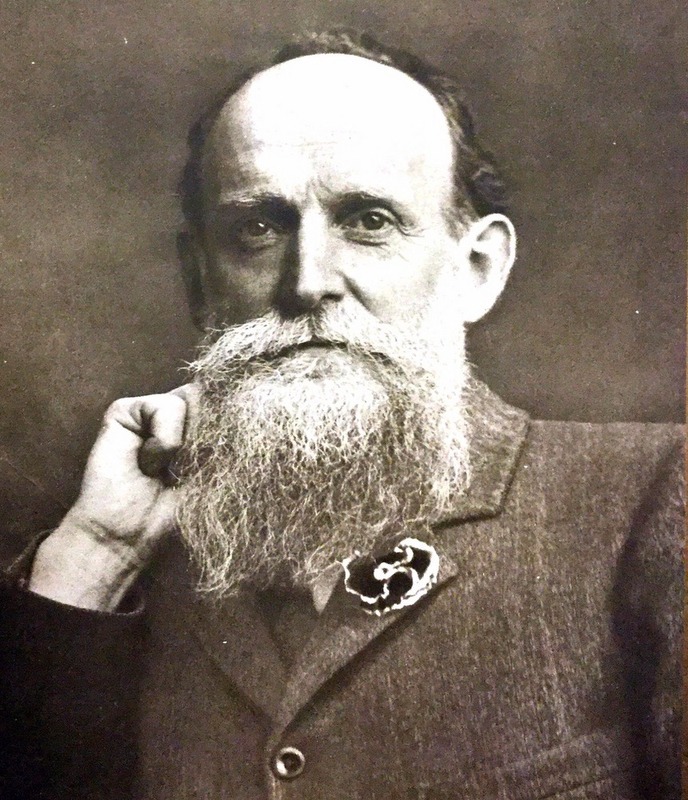 John Baker from Steyning in Sussex succeeded Edward in 1896, but by then George Holly was the new Post Master running this business from Wistaria on the Street, where it was to remain for the next 40 years. Times were to be hard for him, especially with a severe downtown in trade during the First World War and he eventually put the business up for sale in 1918. 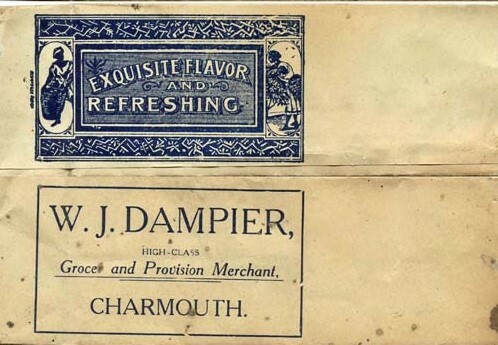 It was to be purchased by William John Dampier who had been a Grocery Clerk for the Department Store of Boons and Sons of Dorchester. 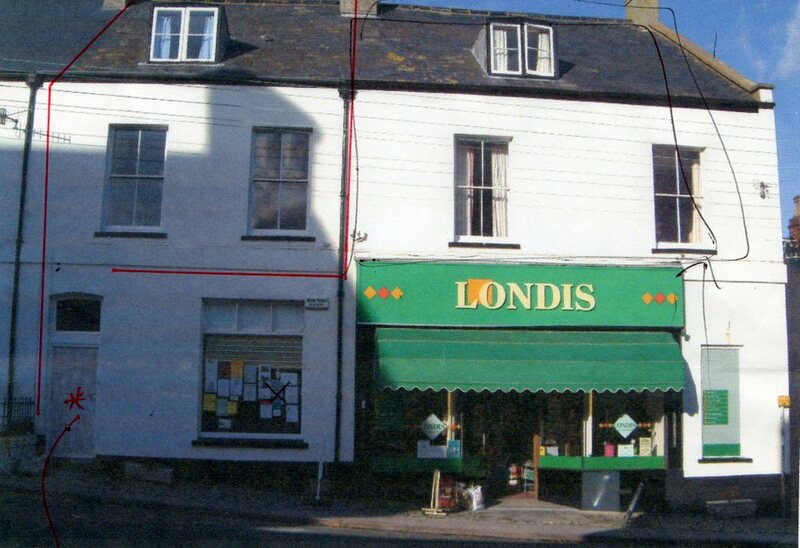 His son, Donald was to follow him into the business and take over in 1954 and in due course his grandson Ronald joined them and eventually ran it from 1970 until 2000.The business has evolved with the times and provides Villagers and Visitors today with a wide range of goods. It is now over 200 years old and would have opened at a time when Nelson had just won the Battle of Trafalgar for the country. The earlier building goes back to at least the 17 th century when it was owned by the Cornelius family. Part of this structure is believed to be incorporated in the rear of the property. 1808 Poor Rates showing Bradbeer Jnr. 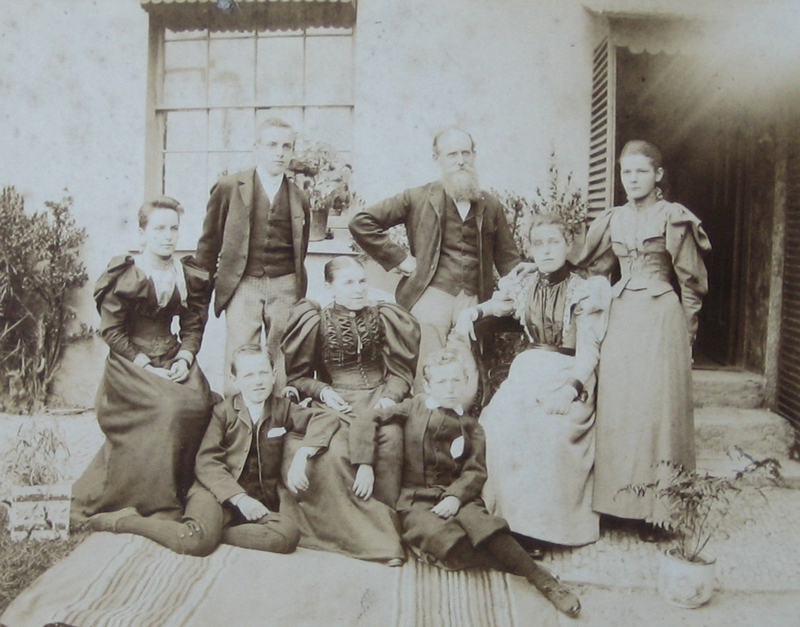 (Francis),as the owner and his father Joseph Bradbeer (Snr.) renting part of building (1/6d.) and Osborne taking the other part (2/-). 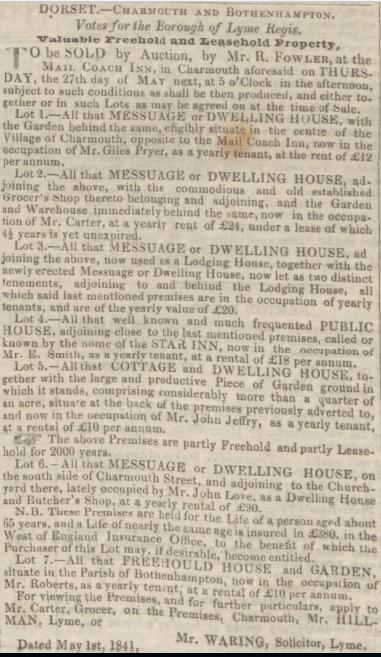 1809 This advert which appeared in the Salisbury and Winchester Journal on the 20th November 1809 is the first reference I have found of the Post Office in Charmouth. 1811 Poor Rates showing Bradbeer Jnr. (Francis),as the owner and his father Joseph Bradbeer ( Snr.) renting part of building (1/6d.) and Osborne taking the other part (2/-). 1813 Poor Rates showing Joseph Bradbeer ( Snr.) owning and occupying part of building (2 1/4).) and Thomas Browning taking the other part (4 1/4) and Thomas Stephens renting the Stable and Coach House,etc ( 2 1/4). 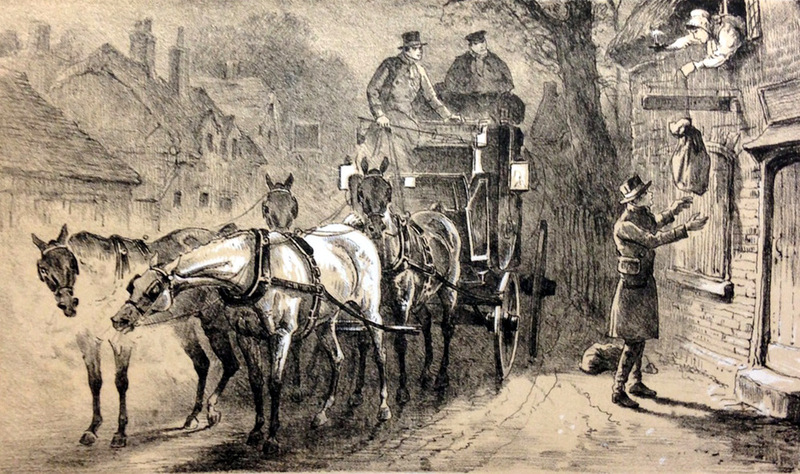 Thomas Browning is a Coachman, probably working at the Coach and Horses Inn opposite. 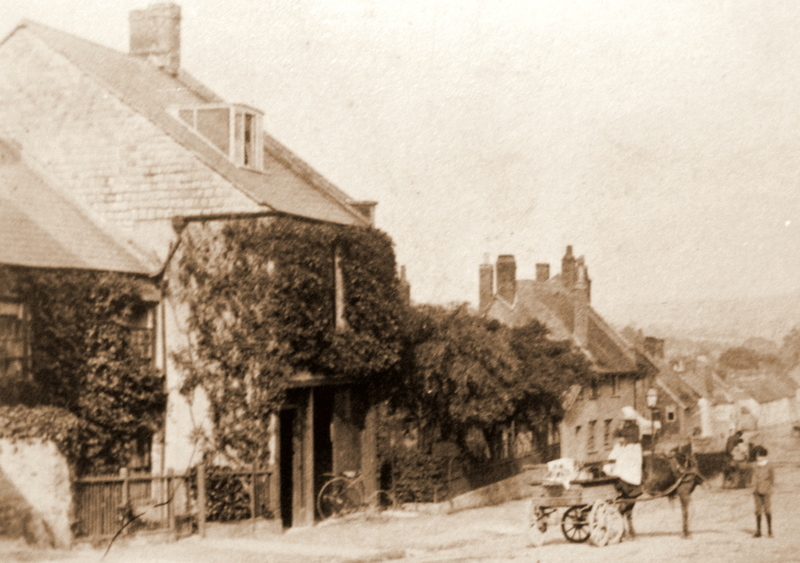 William Stephens is the Landlord of the Coach and Horses and eventualy opens the Star Inn in the Coach House and Stables he is renting from Joseph Bradbeer. 1815 Poor Rates showing Joseph Bradbeer ( Snr.) owning and occupying part of building (4 1/4).) and David Legg taking the other part (2 1/4) and Thomas Stephens renting the Stable and Coach House,etc ( 2 1/4) . Davis Legg is working for Joseph and is mentioned as such in his Will. This is a painting of how the Mail Coach would have looked as it stopped at the Coach and Horses opposite Bradbeers Post Office and Stores. This is a painting of how the Mail Coach would have looked as it stopped at the Bradbeers Post Office and Stores at the end of the day to pick the days Post. 1816 Description of neighbouring property known as Yandover and operated as a Sail Cloth Making Factory by Jacob Ridley Kitt who went bankrupt in 1815 . Part of the property was bought by James and Stephen Atkinson of Beaminster who built the Limes (Charmouth Lodge) on the site of two warehouses. Ann, daughter of Jacob Ridley Kitt opened a shop in what is Little Lodge today and William Stephens an Inn in what was the Star House today. The deeds to Charmouth Lodge in 1816 descibe Joseph Bradbeer as having a house and garden adjoining these properties. All that new Long house , formerly 2 houses with newly erected warehouse and plot of ground behind the same and also a workshop standing on the plot and adjoining the wall which separated the same from the close or meadow , afterwards described, and all the warehouse etc to be abutted and bounded on north by the wallL which separate the same from the close.On the east by a road leading to Wootton on the south by the street and on the west by messuage belonging to Ann Kitt. And by a wall which separates the plot from the garden of Ann Kitt. 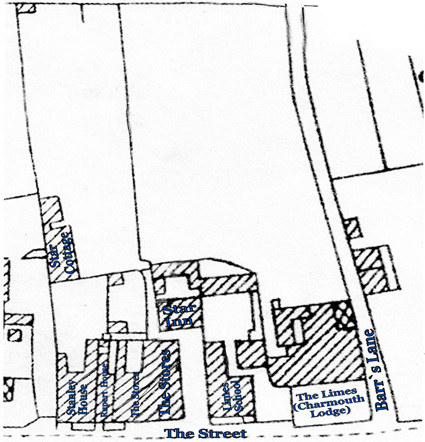 Also all the range of old buildings parallel with the northern end of the garden of Ann Kitt and the garden of William Stephens , Inn Holder and extending from the northern end of the wall which separates the plot from Ann's Garden up to the piling adjoining the garden of Joseph Bradbeer and which said range of buildings contained in length from east to Weather and also that meadow containing about 3 roads abutted and bounced on the north by land belonging to the Rev. Brian Combe. on the east by road to Wootton on the south by a wall which separates the close form the plot of ground by the range of old buildings and on the west by the orchard of Joseph Bradbeeer. All these premises are in the tenure of James and Stephen Atkinson or their tenants.and James Atkinson and Stephen have caused the house with Warehouse and workshop to be pulled down and on the site hav erected 2 new houses.thses houses and gardens are bounced on the North by a wall. 1819 I Joseph Bradbeer of Charmouth in the County of Dorset, Postmaster, being now of sound mind, memory and understanding praised be to god for the same, do make and publish and release this my last Will and Testament in manner following, that is to say, imprimis I give and devise all my Freehold Estate consisting of a Stable, Coach House and Lofts standing near the Church in the village of Charmouth in the said county of Dorset and all my Real Estate whatsover and whenever situate unto my dear wife, Lydia Bradbeer and her Asigns for a during the term of her natural life and from and immediately after her decsea I give and devise the same unto my Grandson, Francis Henry Bradbeer, his heirs and asigns forever.I give and bequeathe to my two grandaughters, Elizabeth Richards and Sarah Richards, £150.I beqeathe unto my son,Joseph Bradbeer £150. I bequeathe unto my son, Francis Henry Bradbeer, £150. I bequeathe to my grandson, Francis Henry Bradbeer all my wearing apparel. I give and bequeathe all my Shop Goods and all Bills, Debts and money owing for goods sold unto my dear wife and all sums of money I give to her from the Post Office at the time of my decease. And also all household goods and furniture in the house wherein and fixtures therin mainly in the Kitchen, next to the Shop..,one Boiler, one Stove.. in the Back Kitchen. Ine Grate, Roasting Fork,.. ..in the Parlour, one grate in the bedroom. All which I give and bequeathe unto my six old Servants whom it is my desire shall carry me to the Grave, namely: William Cousins, William Roper, William Oliver, John Hoskins, Richard West and David Legg, the sum of five shillings each to be paid by my executor... signed by a mark by Joseph Bradbeer.18th September 1819.Witnessed by Willaim Juson, Gentleman,Willaim Burnard, Merchant.Peter Burrell, Solicitor, Lyme, proved 13th April 1821. Erected to the memory of JOSEPH BRADBEER late of this place died 28* March 1821 Aged 69 years. Joseph Bradbeer`s Grave used to be at the front of the Church next to his second wife whose stone can be seen on the right. 1828 Poor Rates showing Mrs. Lydia Bradbeer, owning and occupying part of building (10).) and Welch, Binstead taking part (4 1/2) and Carter Galpin, the famous Artist renting the other part and garden ( 4 1/2). The figures alongside are the estimated rentable values. 1830 Poor Rates showing Mrs. Lydia Bradbeer, owning and occupying part of building (10).) and Joseph Darke (1 1/2d)and Mr.Carter Galpin, the famous Artist renting the other part and garden ( 4 1/2). The figures alongside are the estimated rentable values. 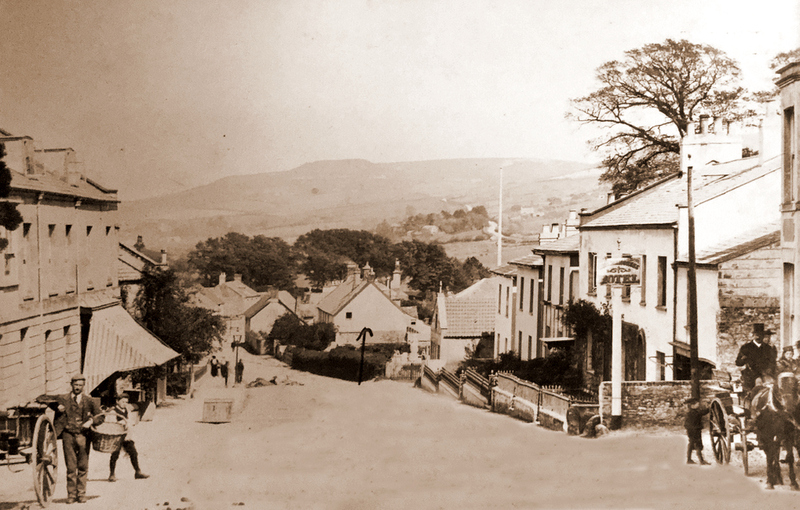 1831 John Carter of Axminster marries Willmet Beer of Charmouth on the 4th September 1832. 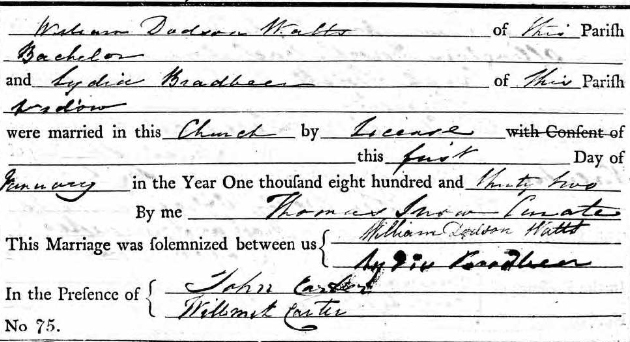 William Watts and Lydia Bradbeer are shown as witnesses as the Carters were later to be witnesses to their own marriage in january the following year. 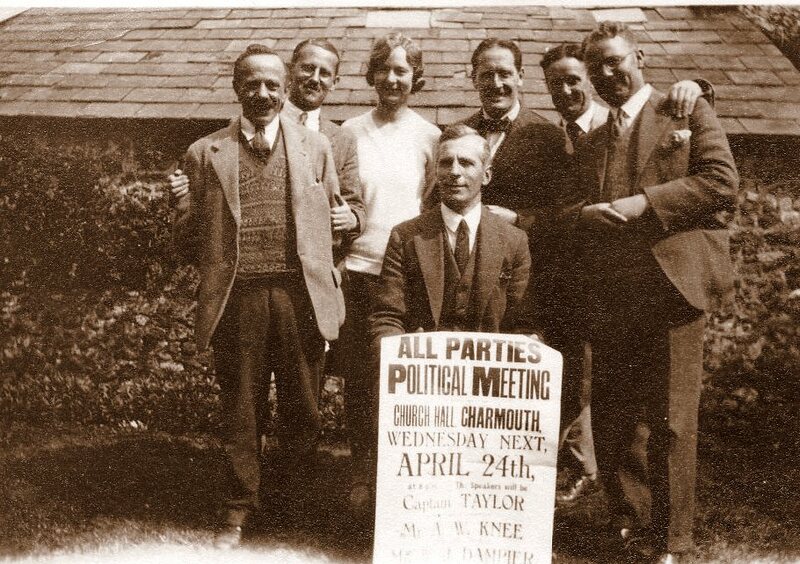 They are all shown to have been married at the Independent Church in Charmouth. 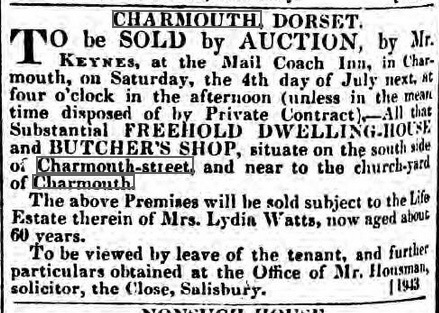 1833 To be sold by Auction, by Mr.Keyes,at the Mail Coach Inn, in Charmouth, on Saturday, the 4th day of July 1833, at four o clock in the afternoon (unless in the mean time disposed of by Private Contract), - All that Substantial Freehold Dwelling House and Butchers Shop, situate on the south side of Charmouth Street, and near to the church-yard of Charmouth. The above Premises will be sold subject to the Life Estate therein of Mrs. Lydia Watts, now aged about 60 years. 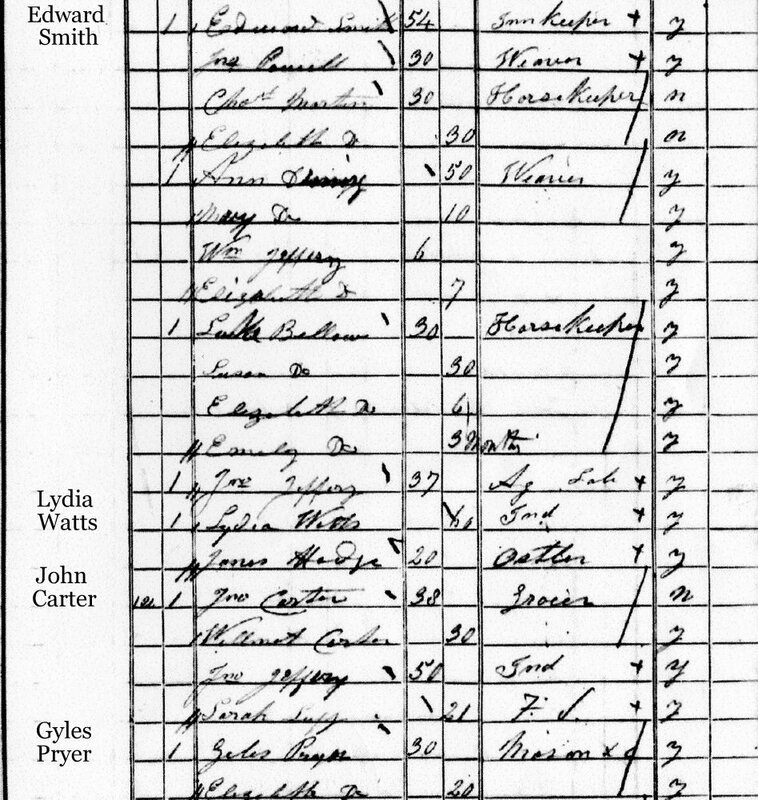 1833 Voters List shows John Carter as a Carpenter. 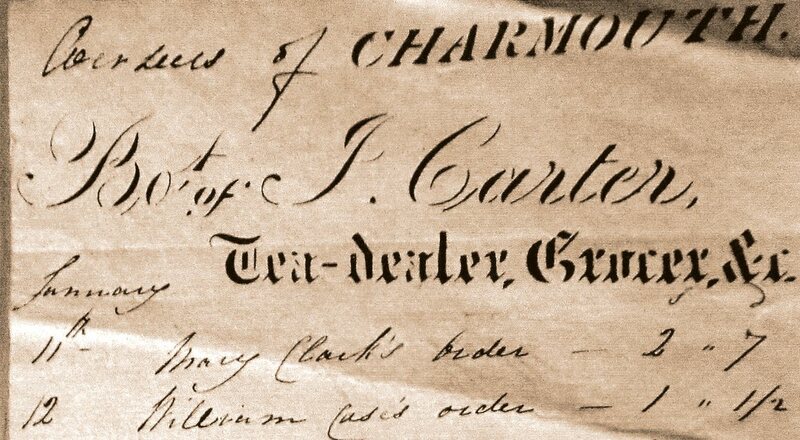 1839 Directory showing John Carter as a Grocer, Builder and Post Master, with the times letters arrive and despatched. 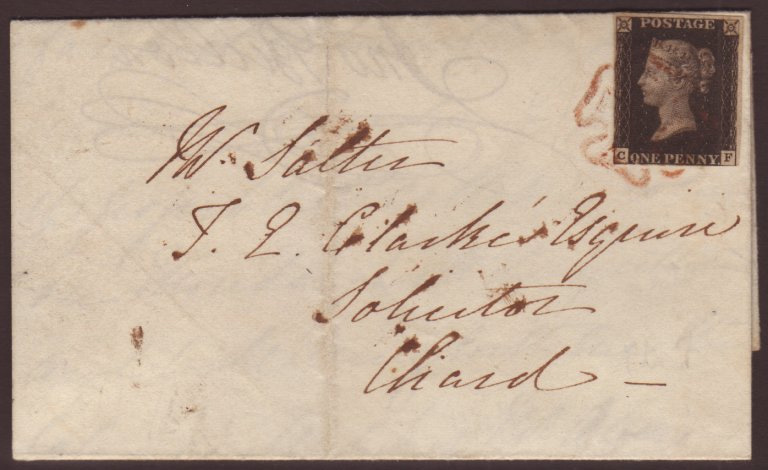 1840 Penny Black on letter posted in Charmouth from John Carters Post office to William Salter, a Solictor in Chard, Somerset. 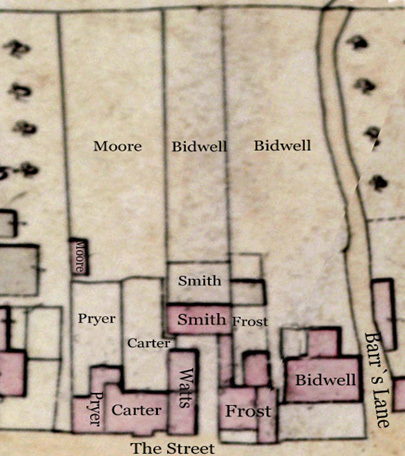 1841 Map showing the building prior to the 1864 fire. 1926 Map showing Prospect View after the rebuilding. Lot 1- All that Messuage or dwelling house with the Garden behind the same, eligible situated in the centre of the village of Charmouth, opposite to the Mail Coach Inn, now in the occupation of Mr.Giles Pryer, as a yearly tenant, at the rent of £ 12 per annum. 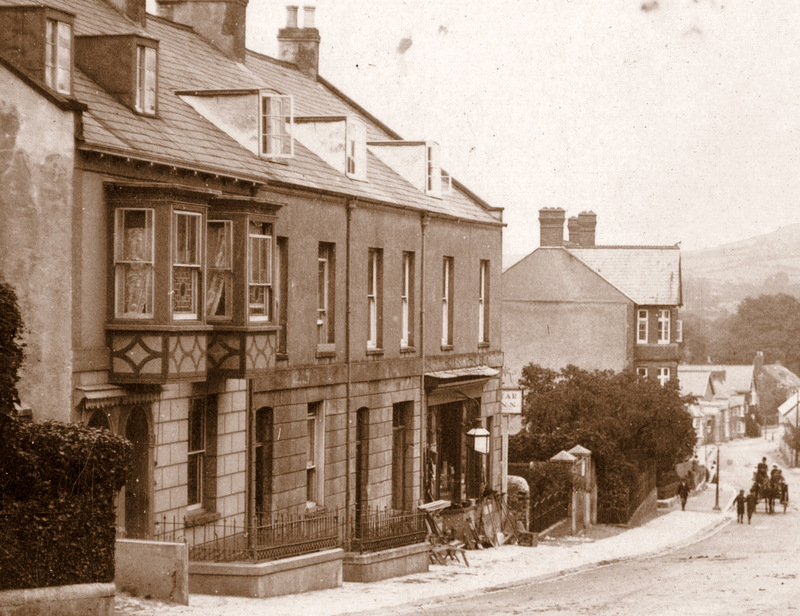 Lot 6 - All that Messuage or Dwelling House, on the side of Charmouth Street, and adjoining to the Church Yard there, lately occupied by Mr. John Love as a dwelling house and Butchers Shop, at a yearly rental of £ 20. N.B. These Premises are held for the Life of a person aged about 65 years, and a Life of near the same age is insured in £ 380. In the West of England Insurance Office, to the benefit of which the Purchaser of this lot may, if desirable, become entitled. 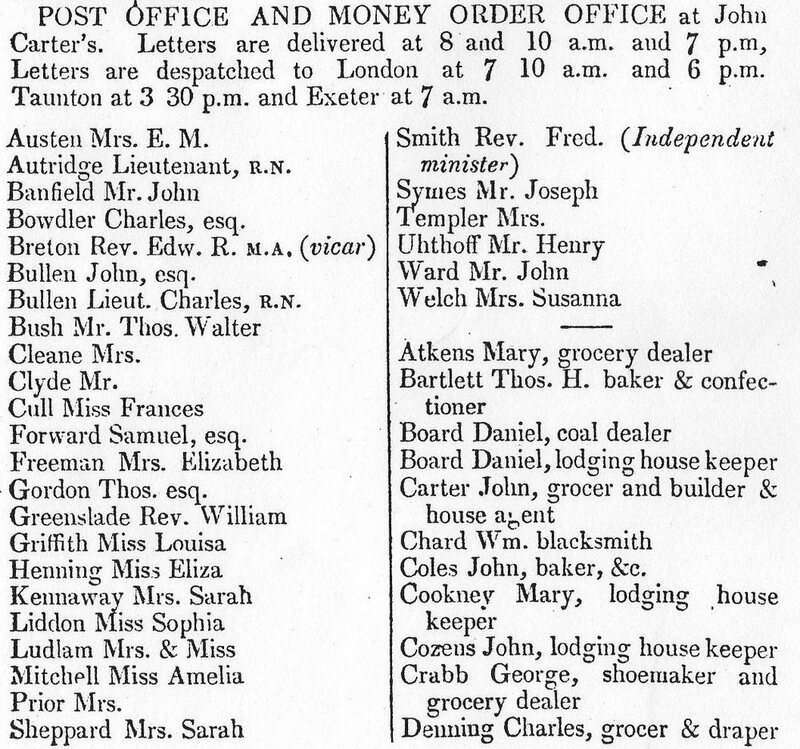 1851 Directory showing John Carter operating a Post Office as well as being a Grocer, Builder and House Agent. Charles Denning was running a similar business on the other side of the passage that lead to the Star Inn. This Post Office record for 1855 shows Wilott Carter taking on the position of Post Mistress on the early death of her husband. 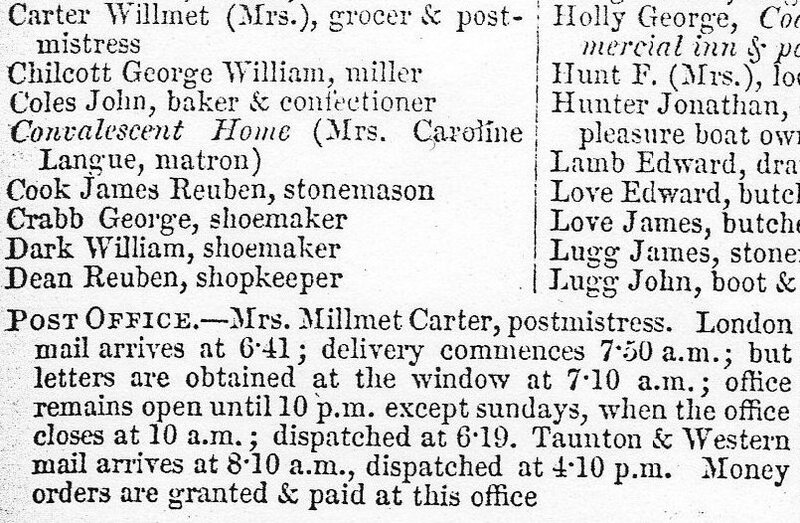 1859 Directory shows Mrs Willmet Carter as Postmistress and Grocer. In memory of/JOHN CARTER/who departed this life/April 20* 1855/Aged 51 years/Also of GEORGE son of the above/who died Sept 19* 1857/Aged 3 years/Also of HENRY BEER CARTER/who died June 26* 1862/Aged 19 years/Also of WILLMET CARTER/wife of the above JOHN CARTER/who died April 4 th 1863/aged 54 years. 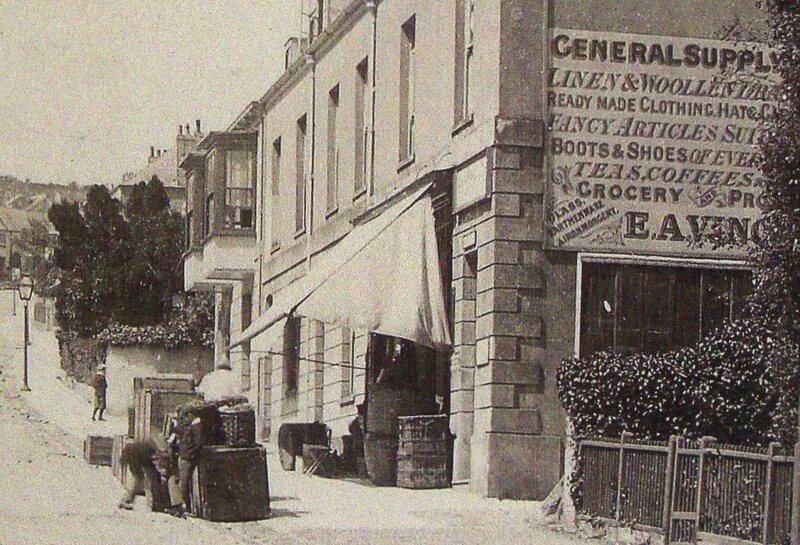 John William Carter, born in 1843, is shown in 1881 as a Grocer in Rugby employing 3 men. 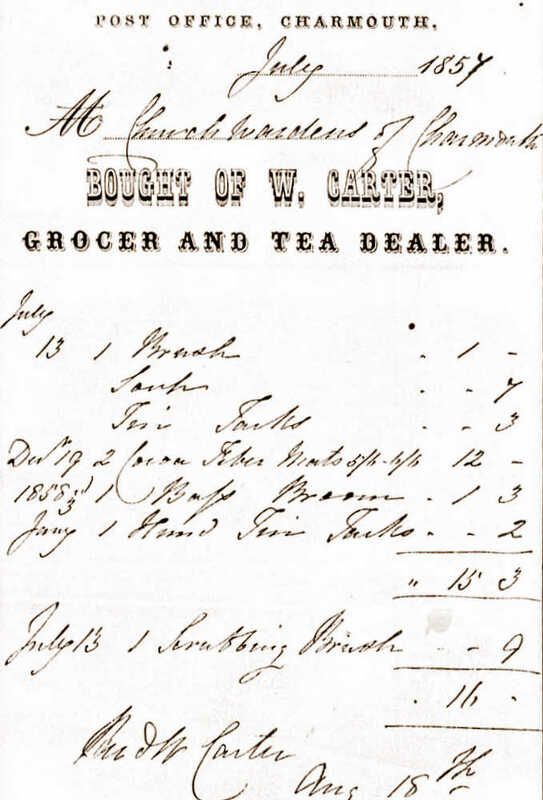 1861 Census shows Willmot, Widow of John Carter described as a Post Mistress running the shop with her son John William Carter (aged 19), shown as a Grocer. 1868- To be let, a new House, consisting of five bedrooms, drawing, dining, and breakfast rooms, kitchen and offices, with walled garden. The House adjoins the Post Office and can be seem on application to Mr. Hawkins, grocer, &c, Charmouth. 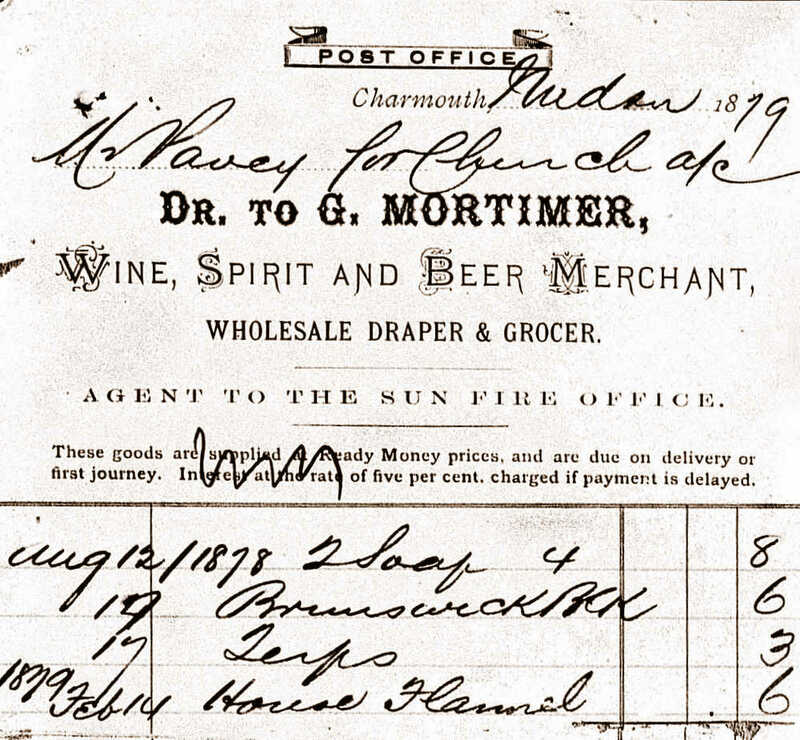 1871 Census shows George Mortimer (aged 28) originating from Morchard Bishop in Devon as a Post Master and Shop Keeper. He is married to Mary Ann (aged 26) from the same village. His brother, John is a Shop man in General Shop and the wife`s sister is also an assistant in the General Shop. 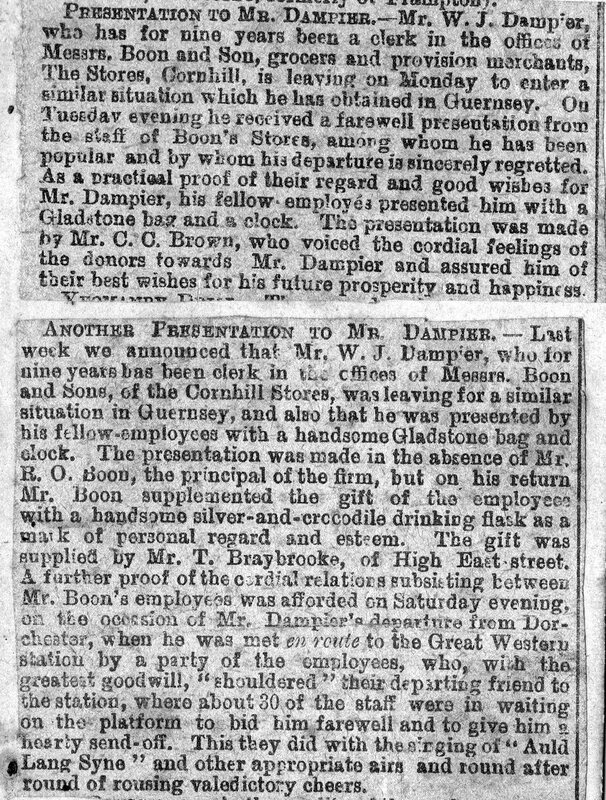 In 1861 George Mortimer is described as a Shop Boy working for his widowed Mother. Sarah in her shop in Murchand Bishop in Devon. 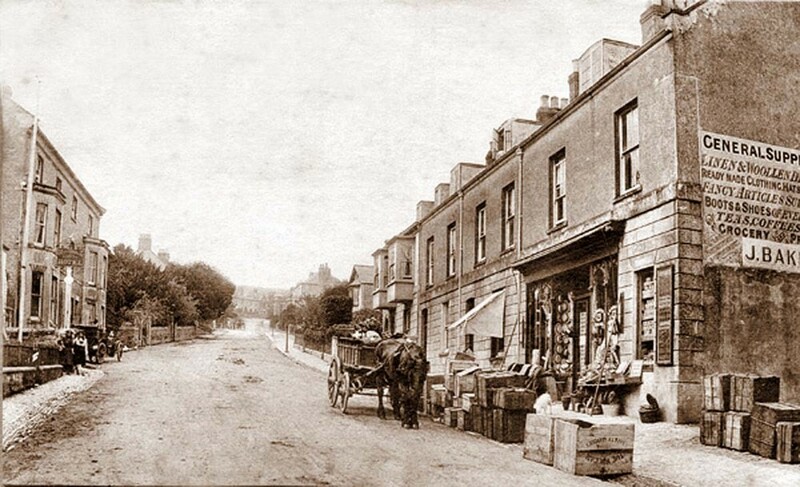 1870 photograph of the newly built stores on the corner of what was was named "Prospect Place". 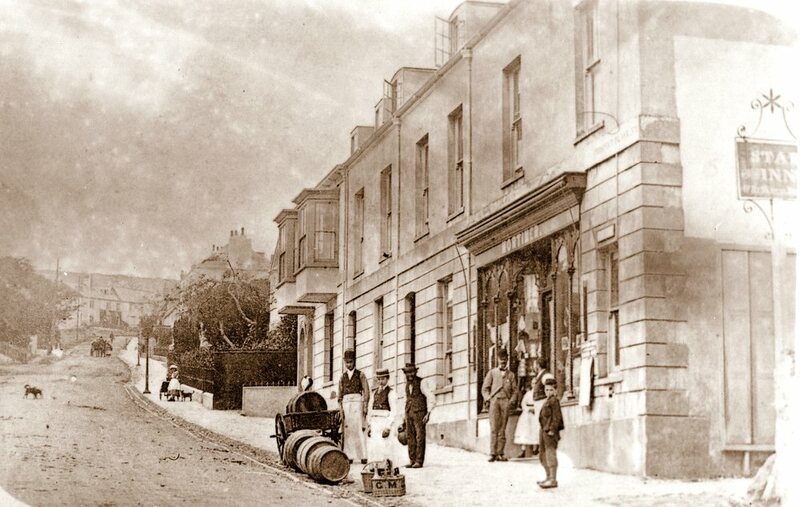 Prospect Place c.1880 when Charmouth Stores was run by George Mortimer, who is seen in the doorway with his staff. John Hodges died in 1874, and in his will left Clarence Villa to his two unmarried daughters Eliza and Ellen. Beech house was left to Richard Hodges, his son, and was let to Robert Manley. 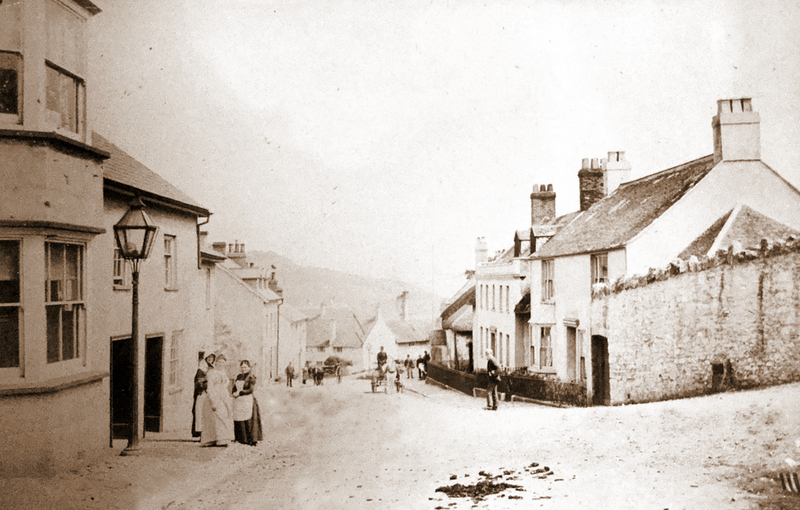 In 1877 the two sisters sold the house to George Mortimer, who ran Charmouth Stores opposite. He eventaully sold it in 1909 to George Hodges, from Portland, in 1909. 1874 Directory Listing for George Mortimer. 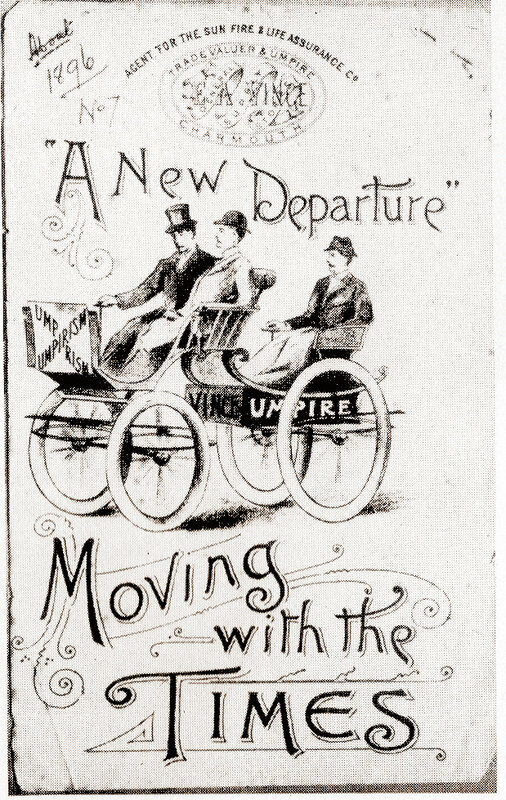 A letterhead from 1878 for George Mortimer. 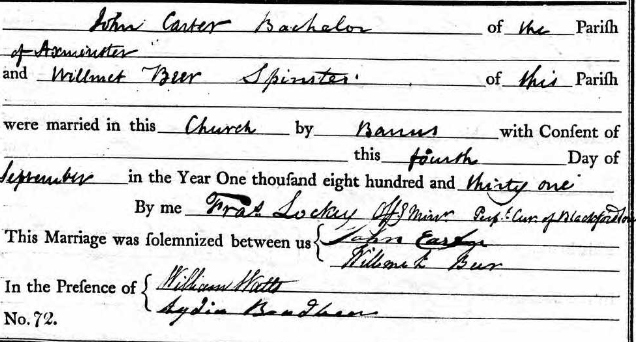 1881 Census shows George Mortimer (aged 38) originating from Morchard Bishop in Devon as a Merchant employing 9 hands. He is married to Mary Ann (aged 38) from the same village. His wifes sisters, Shura and Louisa Reed are Drapers Asssistants and her brother, Henry is a Working Jeweller. He employs Henry Radford and George Ashton as Grocers Assistants. 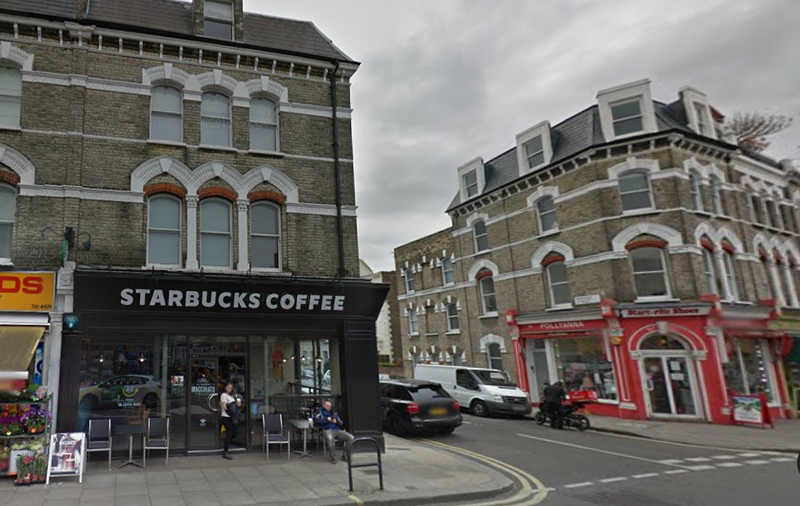 809 Fulham Road where George Mortimer opened his new Grocers Store is today today a Starbucks Coffee establishment. 1895 Rating :List showing that George Mortimer still owned a number of properties in Charmouth, despite moving to London. 1891 Census shows Edward A. Vince (aged 42) Postmatser, Grocer and Draper living with his wife, Catherine(aged 45) and 4v chilfren and shop assistants at Wealdstone House, which is no doubt nos. 1 & 2 Prospect House. 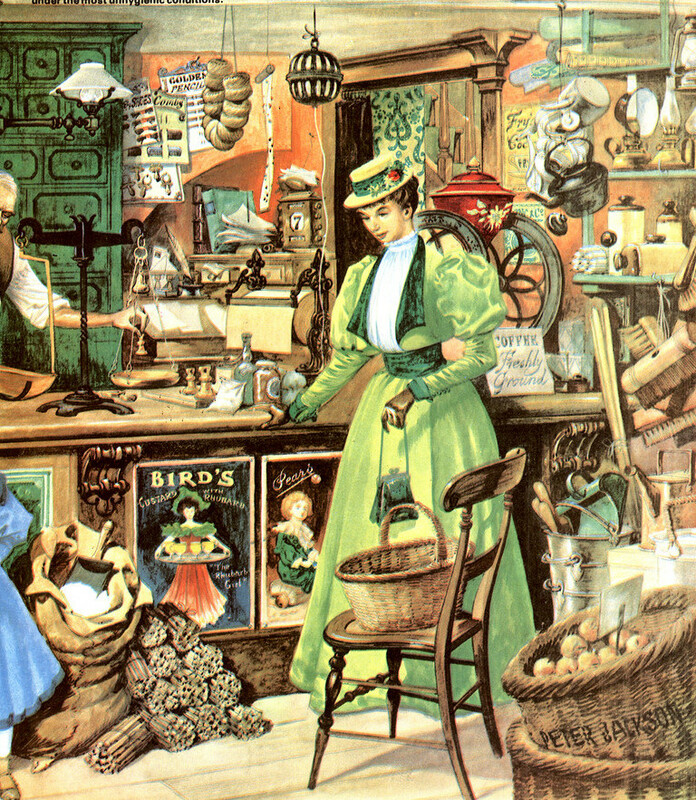 How the shop may have looked in Victorian Times. 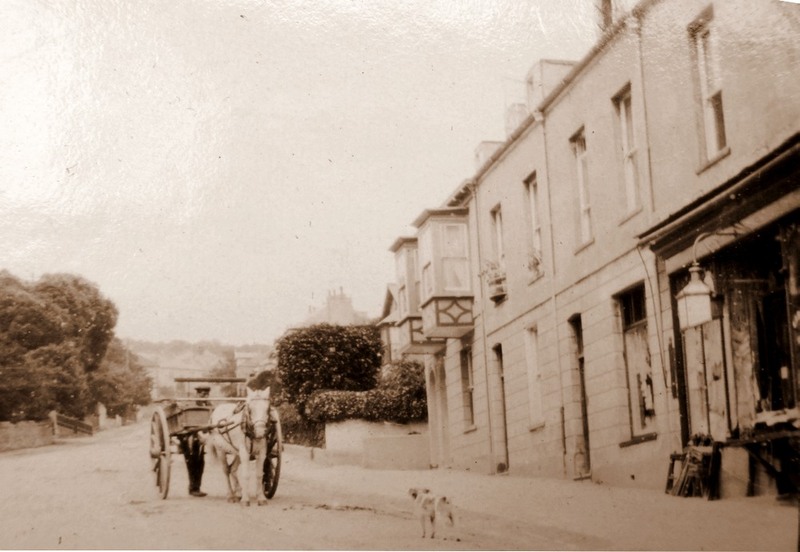 1890 Photograph of a traffic less street apart from a Horse and Cart. Edward Vince was born in Hingham in Norfolk to a family of Grocers and Drapers who had a shop in the Market Place. 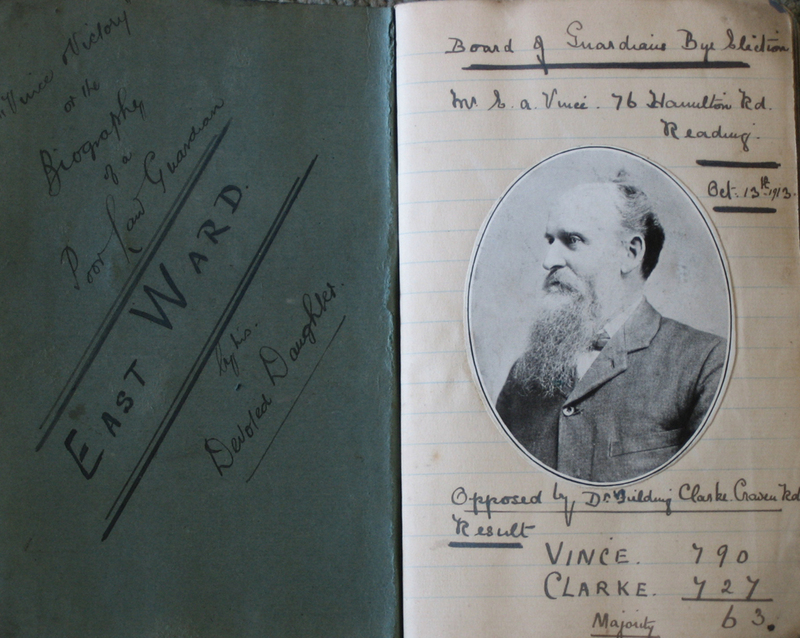 By 1881 he was running the Supply Stores in Bridge Road in Harrow with his wife, Catherine (nee Youngman)He retires to Reading in Berks where he is shown aged 62 living with his daughter,Florence Louisa Vince. 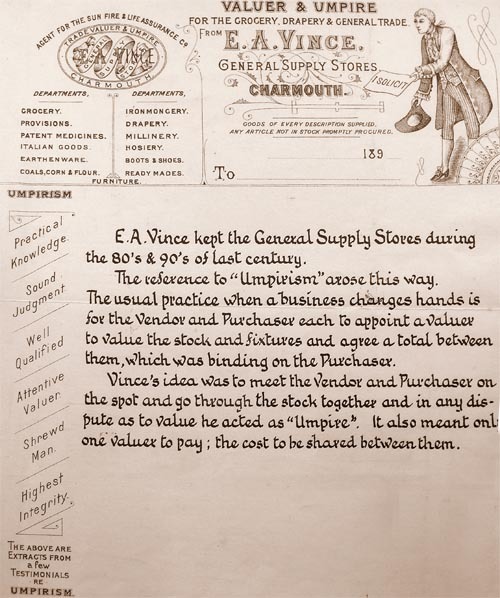 Longs shop was once owned by vince. The photo is of chard and Pigeon the postman. John Baker originated from Steyning in Sussex where his father, James was a Draper and Grocer in the High Street employing 10 assistants. By 1891 he is still single and working as a Grocery asistant in Tunbridge Wells in Kent.Both his parents had died by 1901. 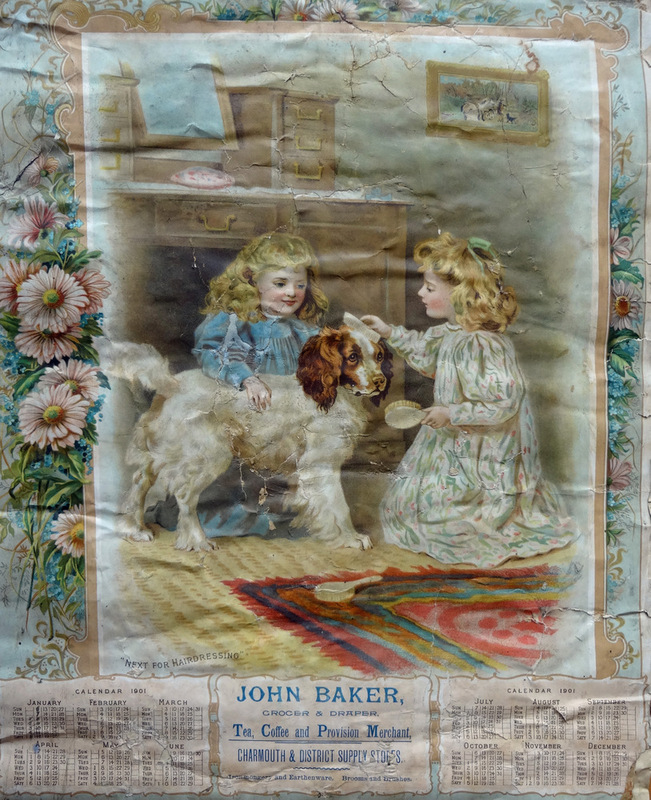 A Photograph of the time when John Baker had it with the name on the side changed from E.A. Vince. 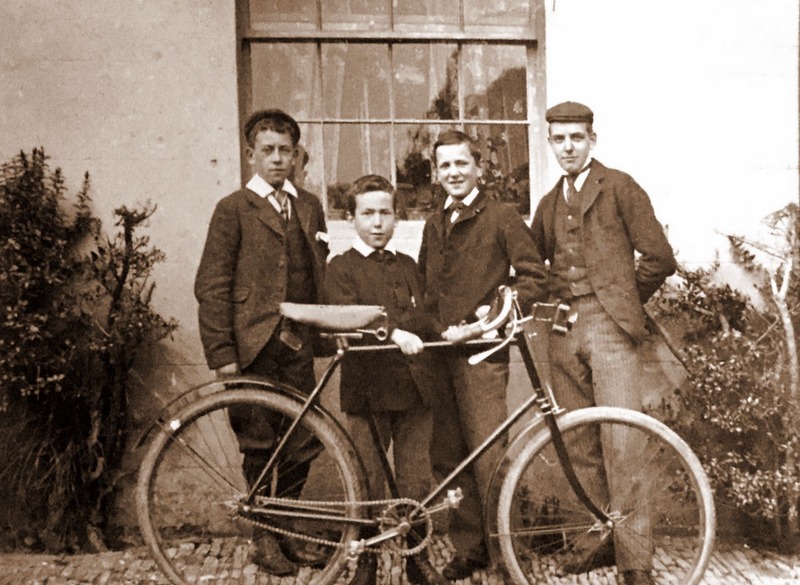 1911 John Baker (aged 40) is a Grocer and Draper living with his wife Martha( aged 38) and children - John aged 10 and Robert aged 6 who were both born in Charmouth. It would seem that he has returned to Steyning where he grew up after running Charmouth Stores and is living at Osborne House. He married Martha Mary Norman at Steyning in 1900. This was to be a Post Office as well as a Stores for its first hundred years and was one of the earliest in the country. For the Royal Mail as we know it today was initiated by John Palmer of Bath in 1787 with its first fast service from Bristol, via Bath to London. The following year he began running his coaches from Exeter to London and they would have passed through the village. The Three Crowns was to become a Coaching Inn, owned by William Edwards but run by Joseph Bradbeer from that time, for almost twenty years. 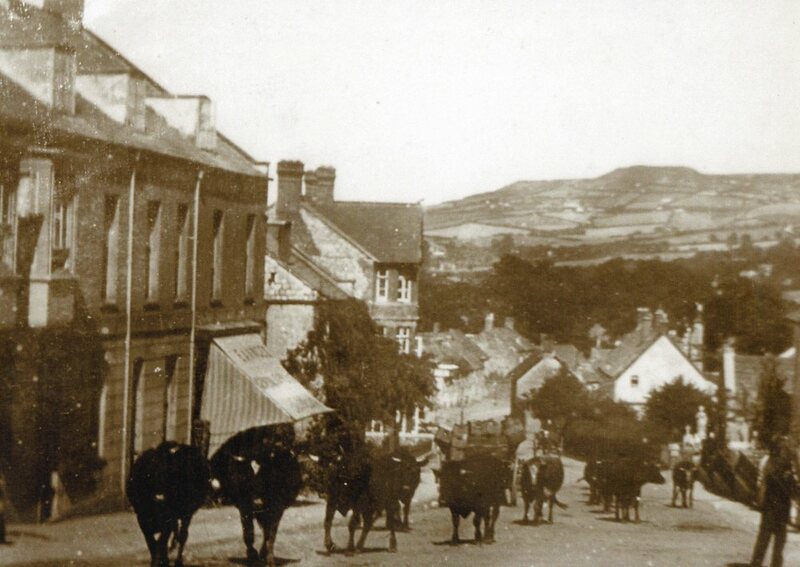 The trade was so important that it was renamed “ The Mail Coach Inn ” and subsequently the “ Coach and Horses ” . He opened the Post Office in part of the present building in 1806, which due to a tragic chain of events already described was inherited by his son, Francis. 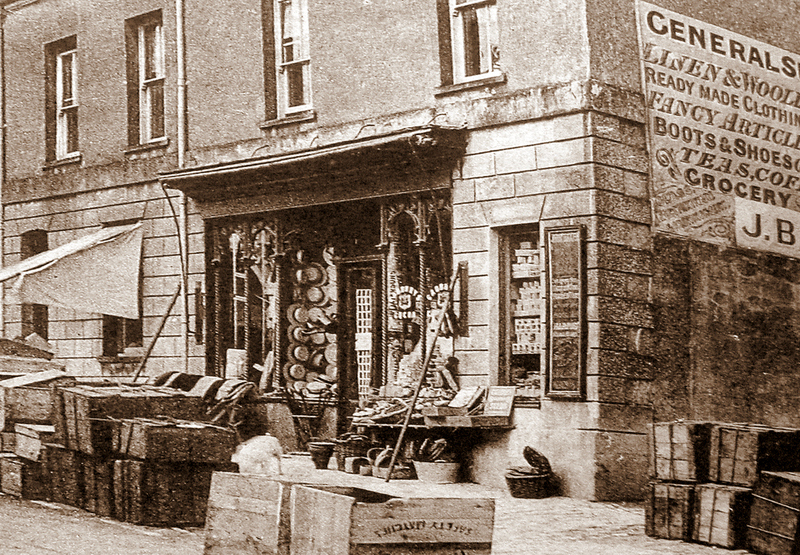 On Joseph`s death in 1821, the business continued with his wife, Lydia who rented part of the building to John Carter, who opened a shop there in 1832. After a disastrous second marriage to William Watts, she loses her properties, which are auctioned in 1841. 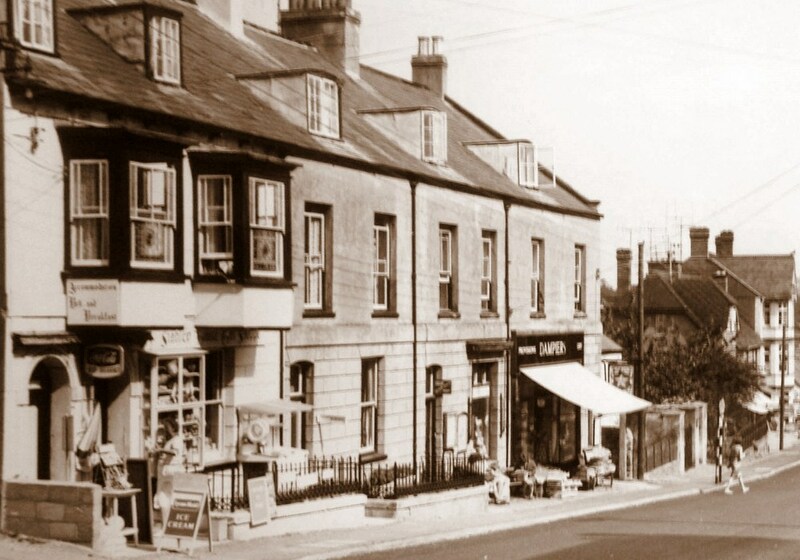 The Tithe Map and Census for the same year, show her, now single, running a shop in what is now Charmouth Stores, with John Carter taking over as Post Master, in the central section of the building. 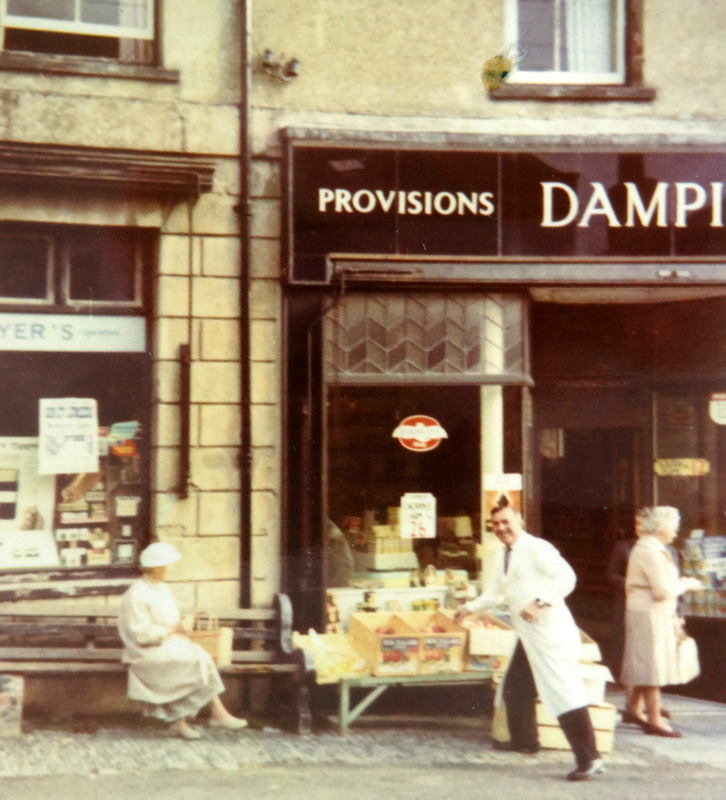 Directories of the time advertise the business as that of a Grocers, Post Office and Builders.The next family to own the shop were the Carters who were to be there for the next 30 years. 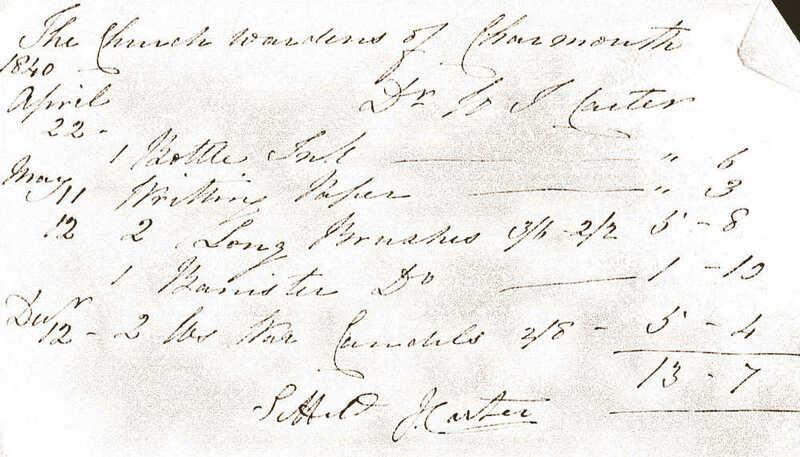 John Carter who came from Axminster, is described as a Carpenter on the list of Charmouth Citizens who could stand for Jury Service in 1833. He had a workshop on the corner of Lower Sea lane where the Chemist is and a yard, which would have been where the parade of shops are today. By the following year he is shown as a Grocer probably running it from the same premises. He goes on to purchase the shop from Samuel Aplin in 1838 and continues to advertise himself as a builder. 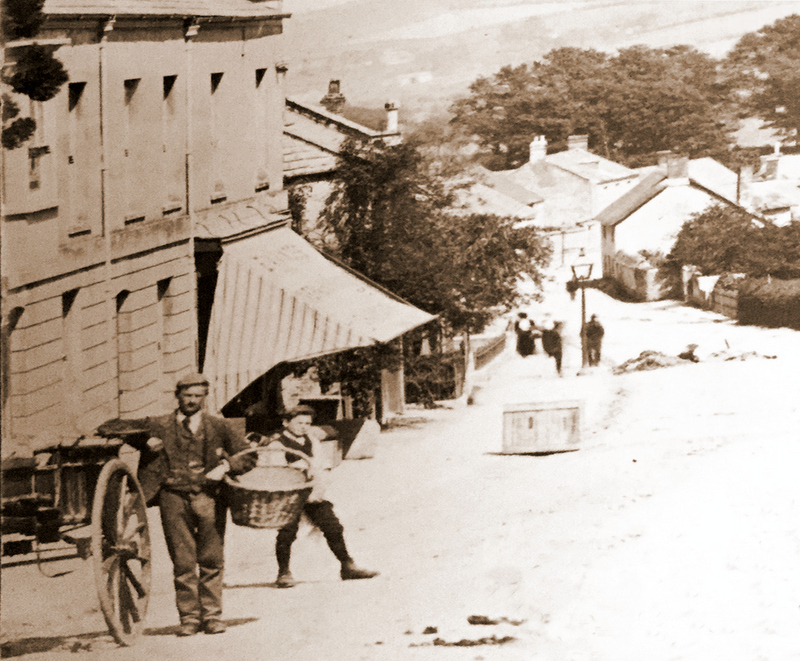 He was also the Village Postmaster right at the beginning of the Penny Post in 1840 when the Penny Black was introduced as the first Postage Stamp. The 1841 Census for which he the Village Enumerator describes him as being aged 38, living with his wife Willmet, aged 30. 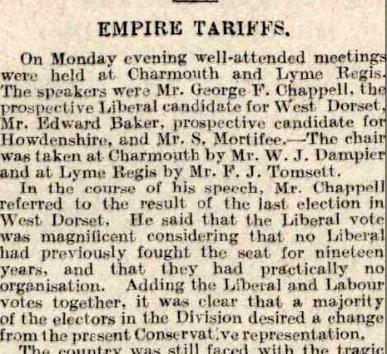 They were to have a son, John, who was born in Charmouth in 1842. Directories of the time advertise the business as that of a Grocers, Post Office and Builders. Sadly John was to die young in 1855 and leaves the shop, three houses in Catherston and a house in Sea Lane (Lower Sea Lane) to his wife who continues running the business with the son, John William (born 1841) later taking it over. The Kelly's Directory of 1859 details the opening hours for the Post Office which stretch from 7.10 in the morning until 10 pm at night. 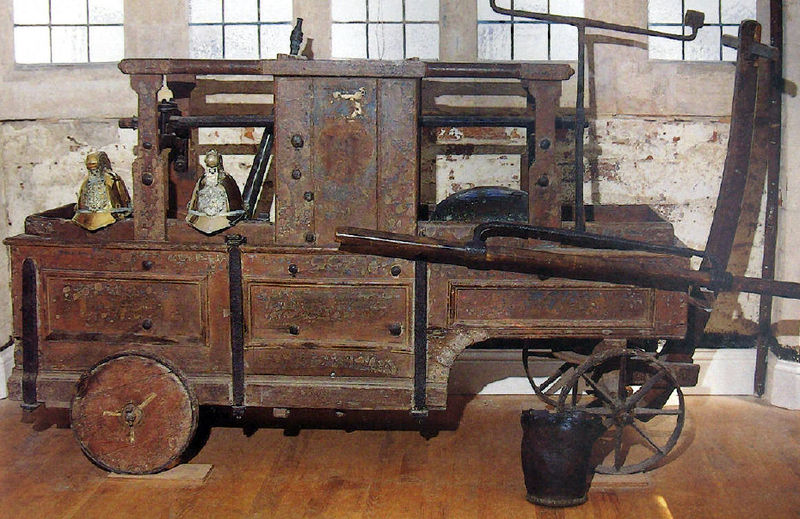 In 1864 the Carters business was to dramatically change after a fire broke out in Pryer`s roof. 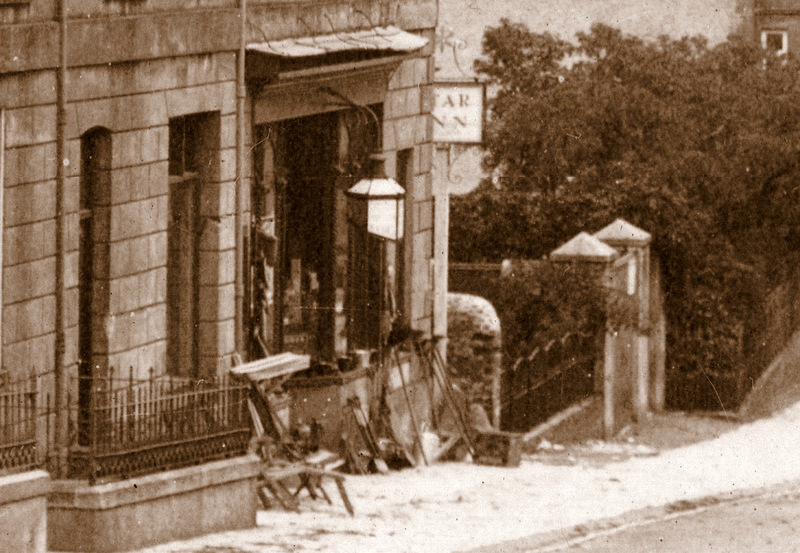 The fire engine came from Lyme Regis and put it out, but it started up again the following morning and spread to the other adjoining buildings which were burnt to the ground. 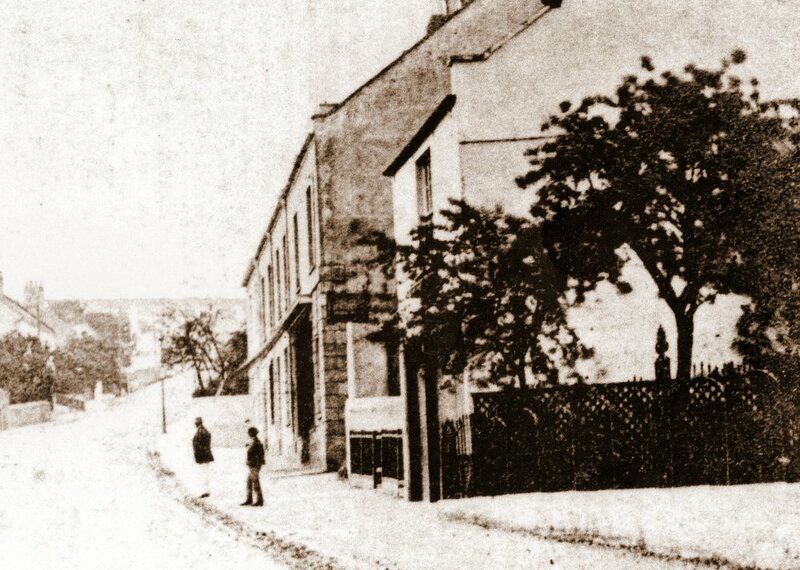 The houses when they were rebuilt were called "Prospect Place". The house on the westward end of Prospect Place is named "Stanley House" and was left by Pryer to his son Henry William on his death. His workshop and yard were on the corner of Sea Lane, where the group of shops are today and had previously been John Carter`s Premises. 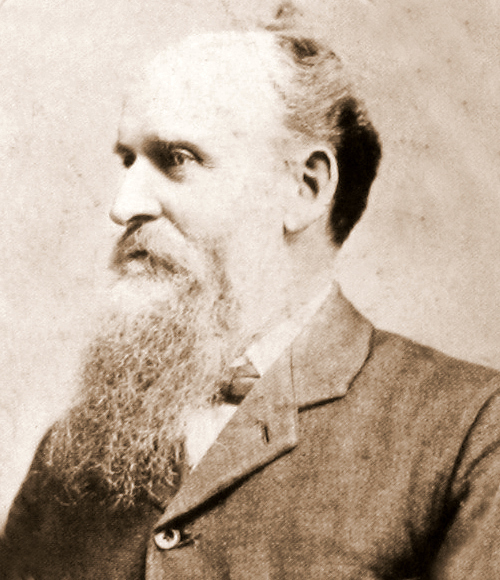 The following year John William Carter is back in business and advertising in the local directory as Grocer and Postmaster. 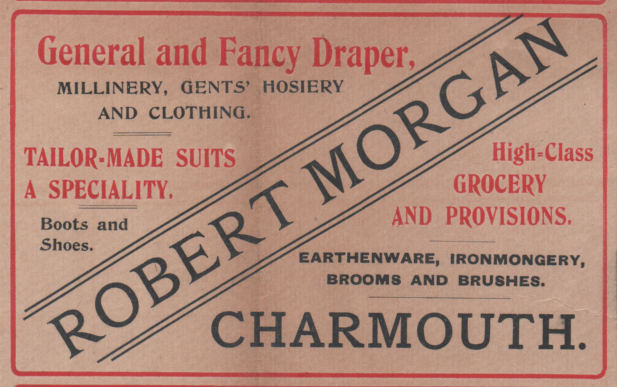 He continues for awhile, but by 1870 George Mortimer is the owner and an advert a few years later reveals the wide range of goods he can offer. He is shown as a Linen & Woollen Draper, Grocer, Tea Dealer & Provision Merchant, China, Glass, Earthenware & Brush Warehouse and Post Master. 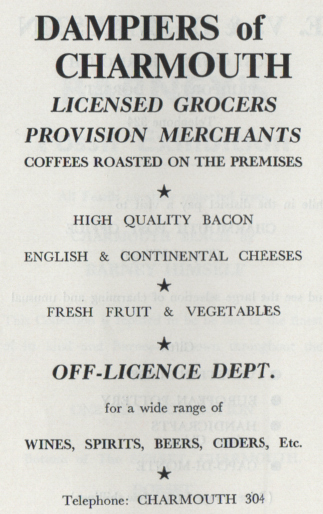 The same directory shows Charmouth having six other Grocers as his competition - how times have changed! 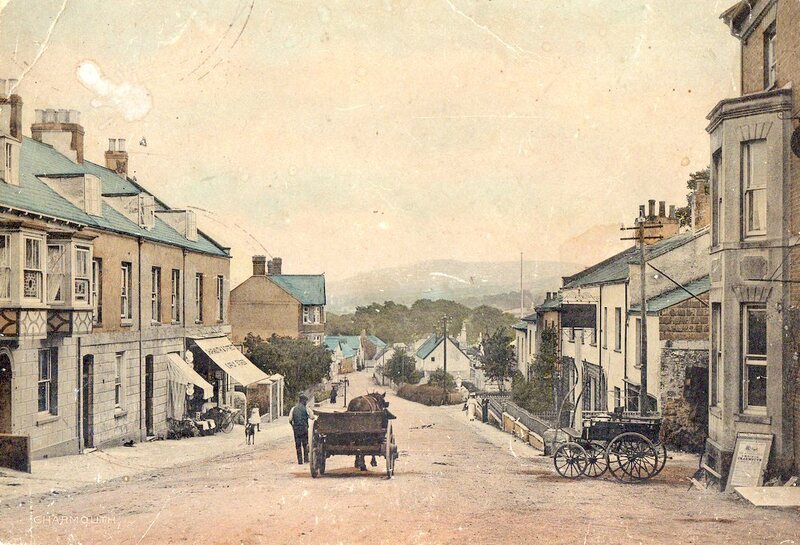 The 1871 Census for Charmouth has George aged just 28, married to Mary aged 26. He is described as a Postmaster and Shop Keeper. It is interesting to see that has brother, aged 15 and wife's sister aged 19 are living with them as shop assistants. By the 1881 Census he is described as a Merchant employing 9 hands, most of whom seem to be living with them. 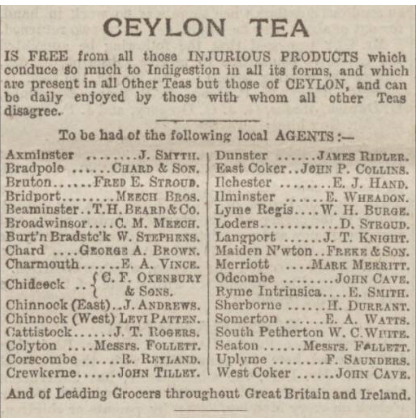 He eventually sells the business to Edward Archer Vince(1849-1917) in 1888 who continues trading in the same style as is shown in a Directory of 1889. Old Photos of the time show a massive hoarding on the side of the building with a long list of all the goods and services that were offered inside. The door to the Post Office appears to be where the small long window was on the front of the building with a wooden sign above it. 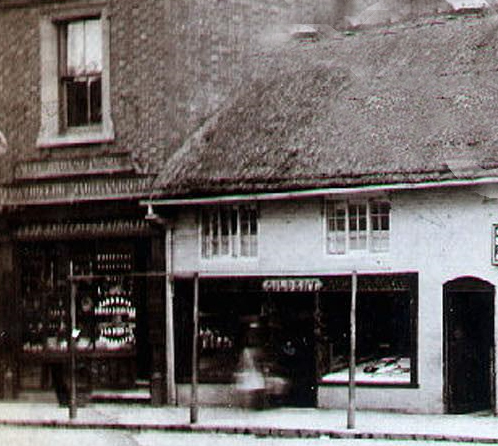 According to Reg Pavey the shop was much smaller than the present day store. 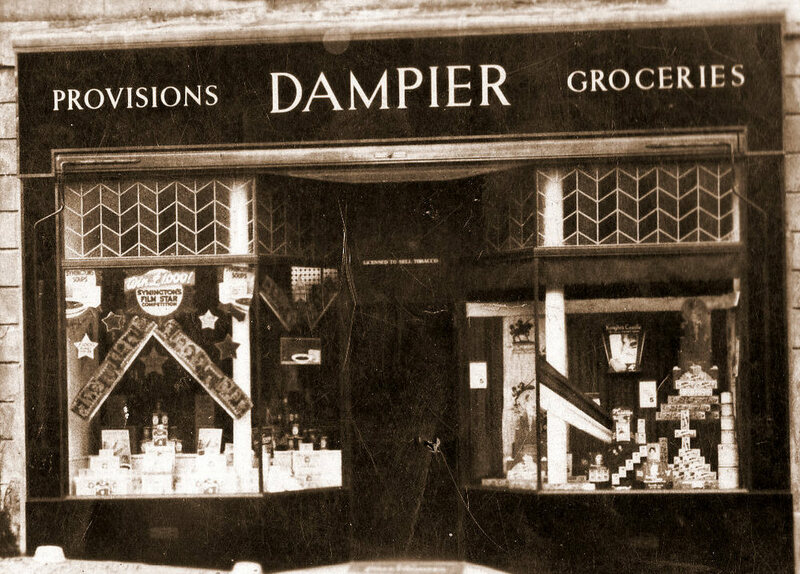 A counter was on the left as you entered for the drapery department and the grocery and post office on the opposite side. 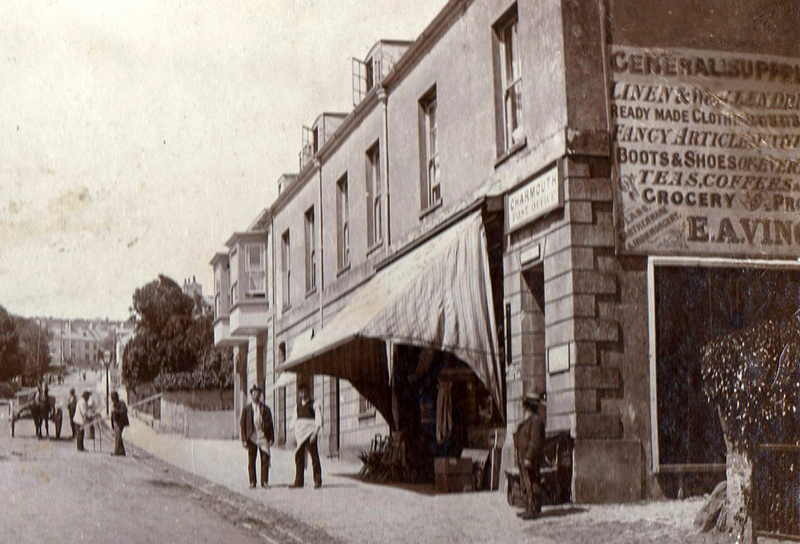 By the late 1880`s customers were able to telegraph from the premises when a wire was laid to Lyme Regis for it. 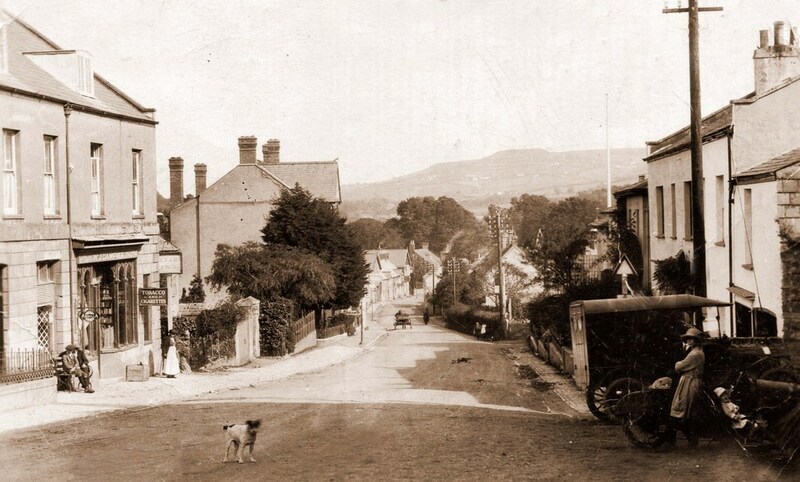 The 1895 Poor Rates listing show that Edward was renting the premises from Henry Burrough, who in due course was to sell the freehold to Alfred Gapper Pass, who owned a large number of properties in the vicinity, including Wootton Fitzpaine and Monkton Wyld. 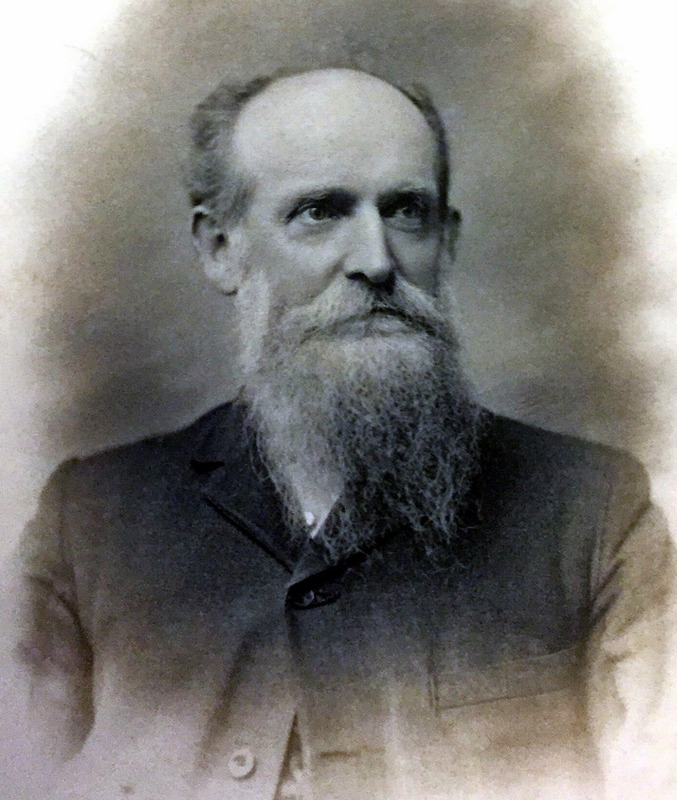 John Baker from Steyning in Sussex succeeded Edward in 1896, but by then George Holly was the Post Master running this business from Wistaria on the Street, where it was to remain for the next 40 years. 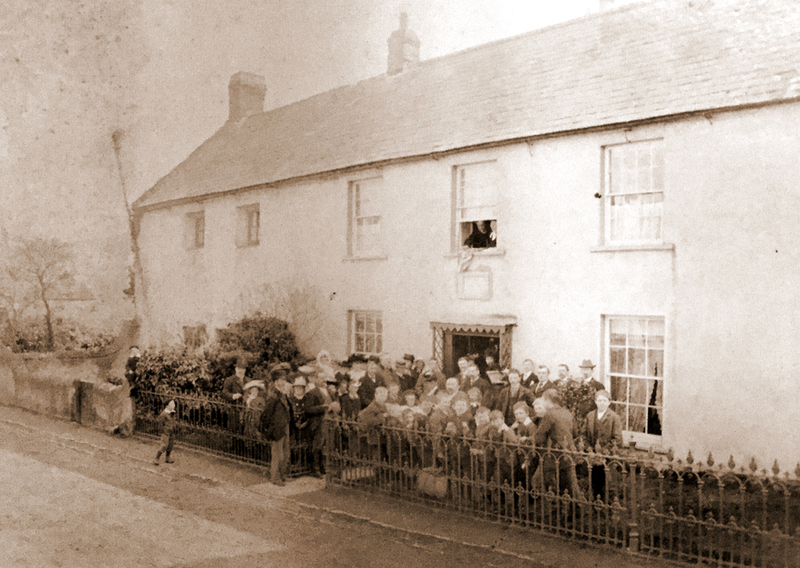 John is shown as being just 30 in the 1901 Census living with his wife Martha and 2-month-old son, John with 3 young shop assistants above the shop. Times were to be hard for him, especially with a severe downtown in trade during the first World War and he eventually put the business up for sale in 1918. 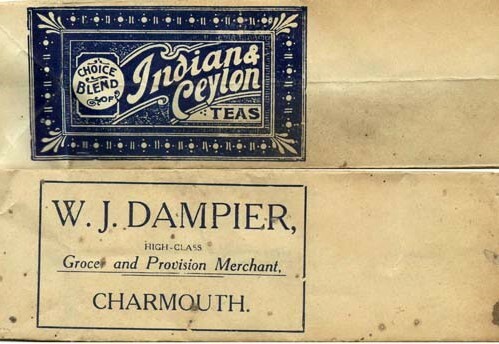 It was to be purchased by William John Dampier who had been a Grocery Clerk for the Department Store of Boons and Sons of Dorchester. He was encouraged by his former Employer who helped him with the finance that he needed. For almost the next century the business was to be family run and very well regarded by villagers. 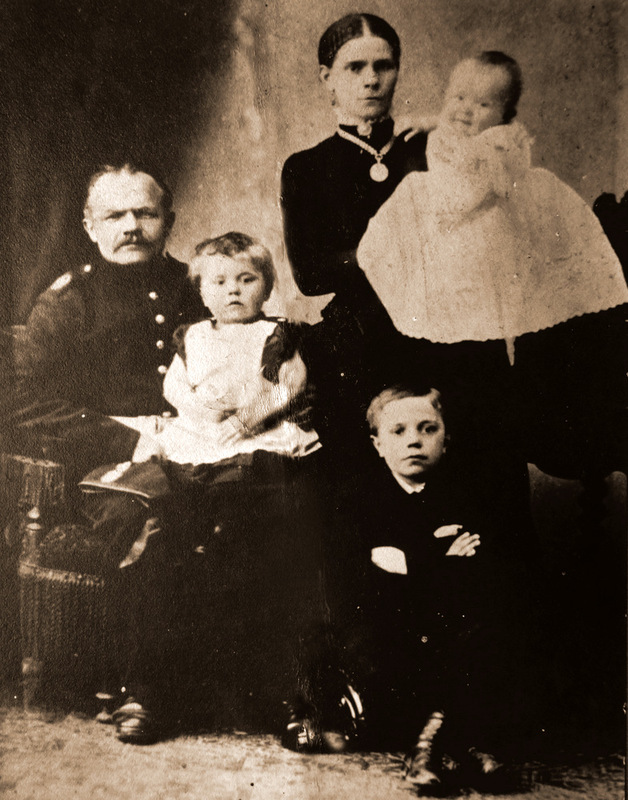 William was born in 1878 and with his wife Laura had two sons and three daughters. His son, Donald was to follow him into the business and take over in 1954 and in due course his grandson Ronald joined them and eventually ran it from 1970 until 2000. 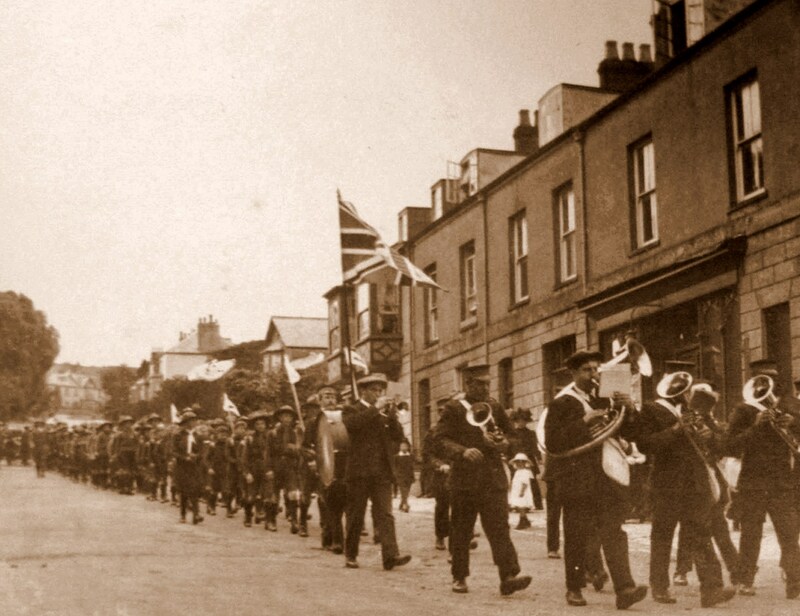 It is Ron, who still lives in the village that I have to thank for assisting with this article and providing the magnificent photo shown here of William with his staff standing outside the shop with its original Victorian Front in 1935. 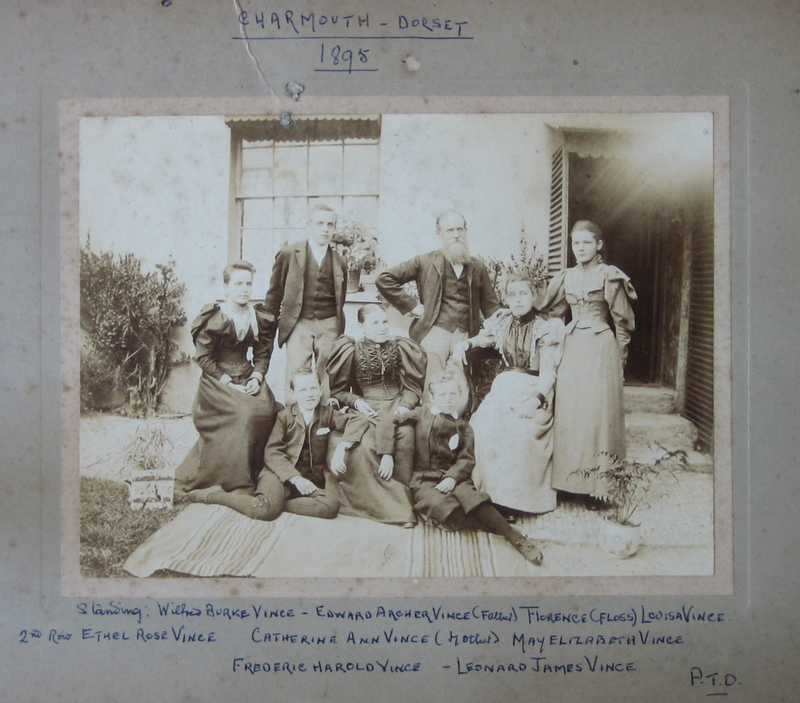 From the left it is believed that the people shown are Percy Larcombe (young assistant who lived next door), Cecil Bugler (Assistant), Sammy Smith (Delivery Man),Peter Oldworth(Provisions), Donald Hubert Dampier(son), Gladys Frampton(daughter), William John Dampier (Owner). 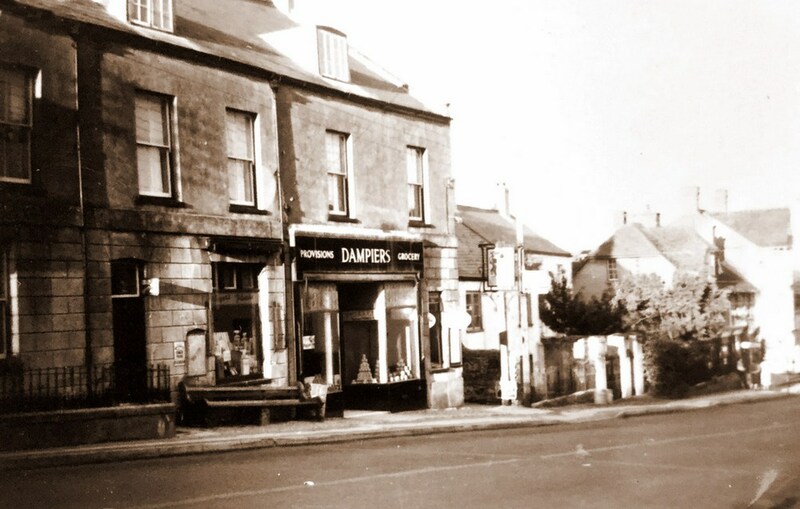 Not long after the shop front was updated to the one that can be seen today. 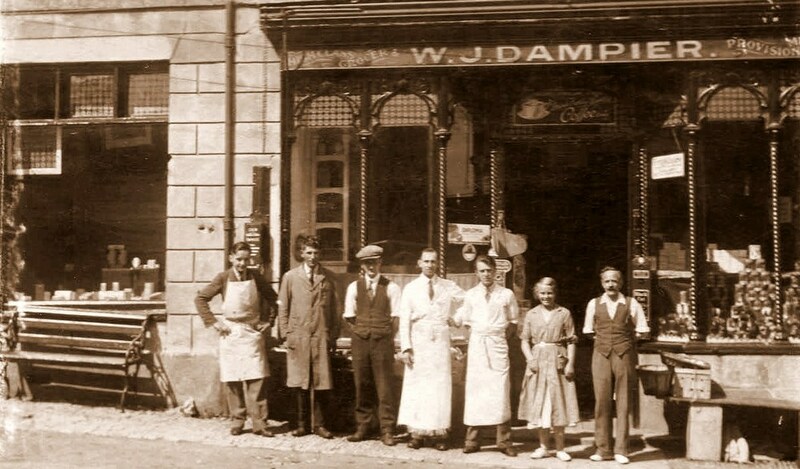 The Dampiers also ran their business from the adjoining premises and the seat that was outside was very poplar and there are usually people to be seen sitting on it on the old postcards. 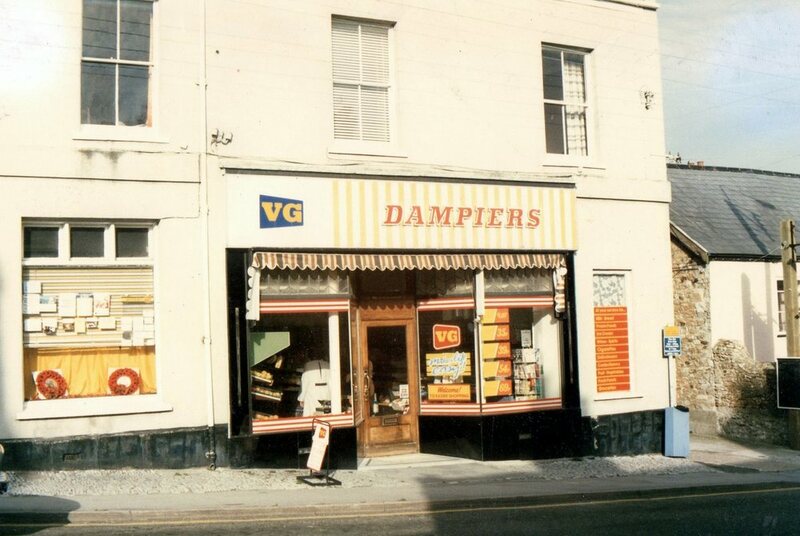 The Dampiers ran a successful business and in due course extended it back and purchased the freehold of the premises from the Pass family. An interesting anecdote regarding the personality of William was revealed in correspondence that Ron still has relating to the famous author, G.K.Chesterton of Father Brown fame. It seems that he and his wife were frequent customers and especially enjoyed the Marmalade that he made and sent to them. 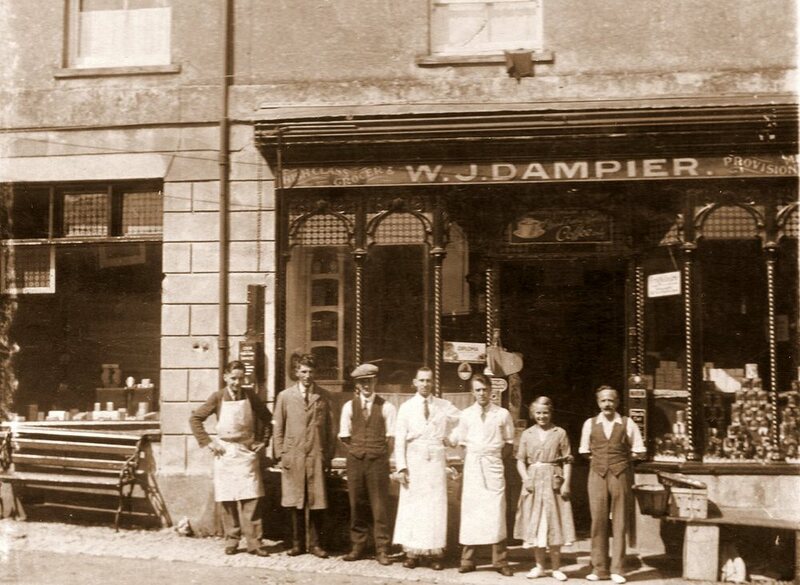 One of the verses he was famous for was “The Wicked Grocer”, which reflected badly on the trade, so much so that he felt that he must right the wrong after the impeccable service he had received from the Dampiers at the Charmouth Stores. So as recompense he penned a new verse in 1929 which he dedicated to William called the Good Grocer that is full of his praises. The family still have a signed copy from Chesterton of this verse as a souvenir. 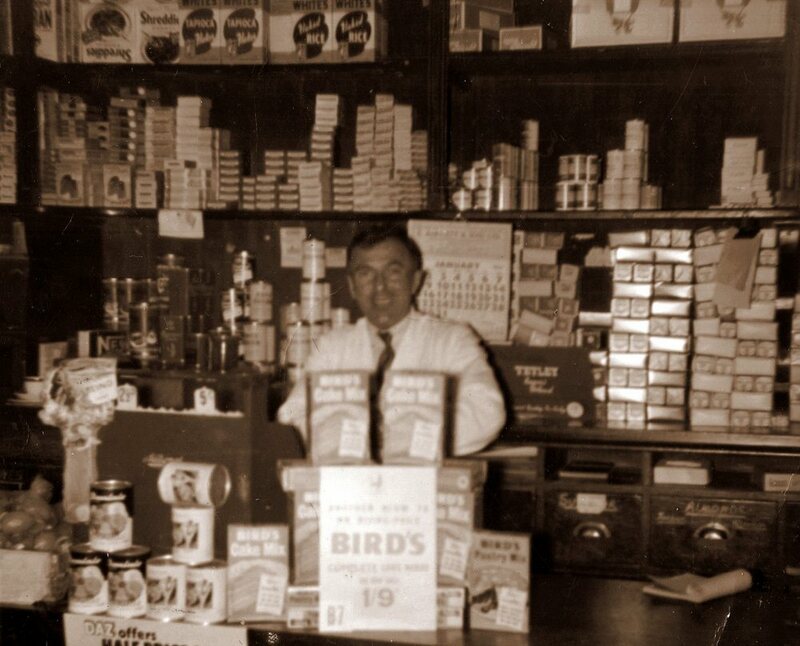 Another photograph shown here is of Donald, back in the 1950`s standing behind the original mahogany counter with the shelves behind him piled high with teas and canned fruit. 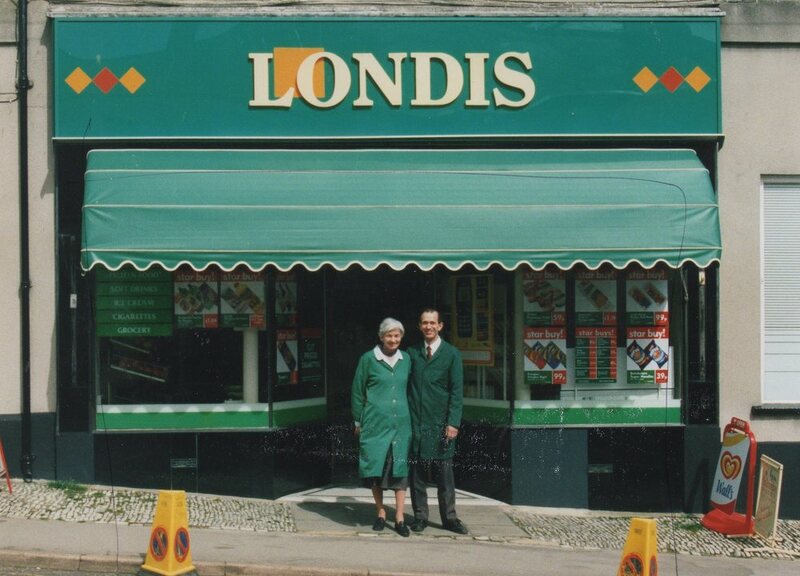 The shop has always kept up with the times and in due course joined various buying groups and the name above the shop changed from APT to VG and then Londis. 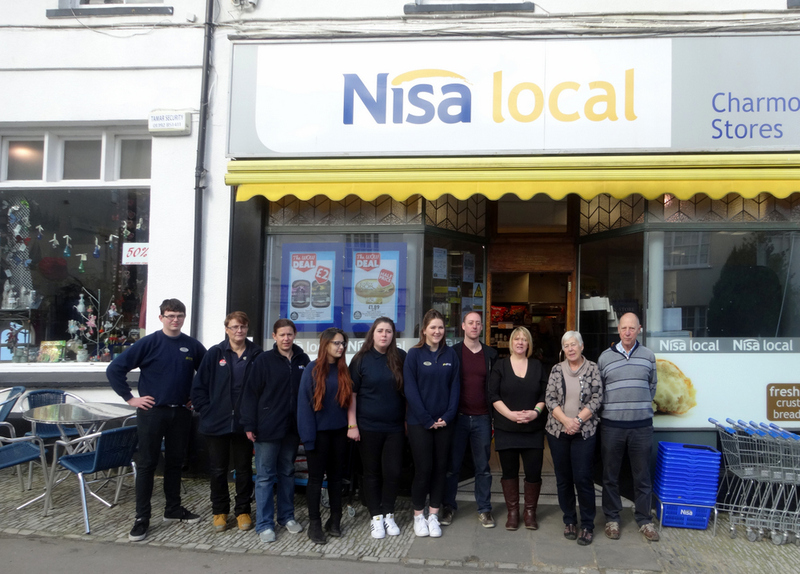 It is now under the Nisa banner, which allows it to have the same competitive, prices as many supermarkets. The owners, Phil and Carol Tritton continue the traditions of the past by offering a wide range of products and services. 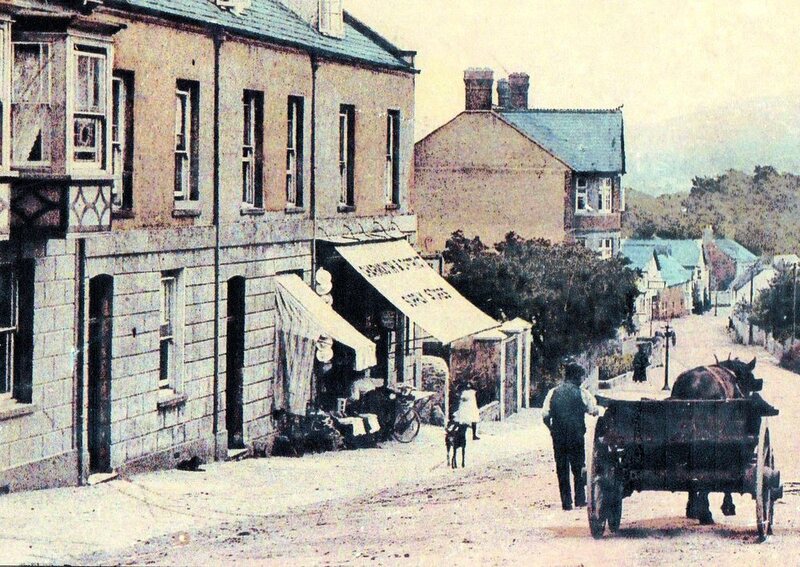 The residents of the village are very fortunate to be able to still shop in a building, which started as a Grocers in the year Queen Victoria came to the throne. 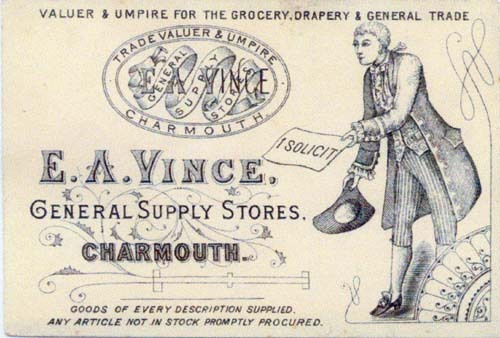 The Poster was produced for John Baker, who ran Charmouth Stores in 1901.It shows him as both a Draper and Grocer, as well as selling Hardware. 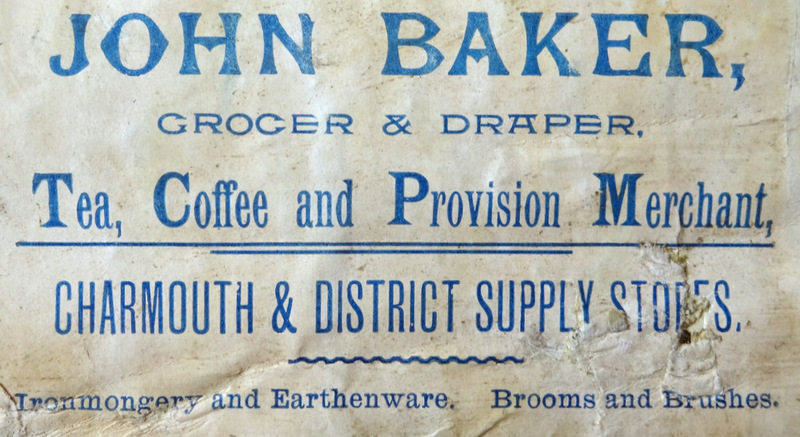 1901 Census shows John Baker as a Draper and Shopkeeper and it would seem that he occupies both 1 & 2 Prospect Place. He is aged 30 and originates from Steyning in Sussex and his wife, Martha aged 28 is from Axmouth in Devon. They have a son, John who is only 2 months and was born in Charmouth. They have 2 Grocers Assistants living with them. 1911 Robert Morgan(aged 36) is now shown as a Railway Bus Contractor and Carriage Proprieter married to Laura Emma (aged 42) and Stepdaughter Laura Pagan and Stepson Jack Pagan. They are living at n0.1 Coastgurad Cottage in Lower Sea Lane. Laura was previously married to Alexander Pagan who ran the Coach and Horses who had died in 1903. 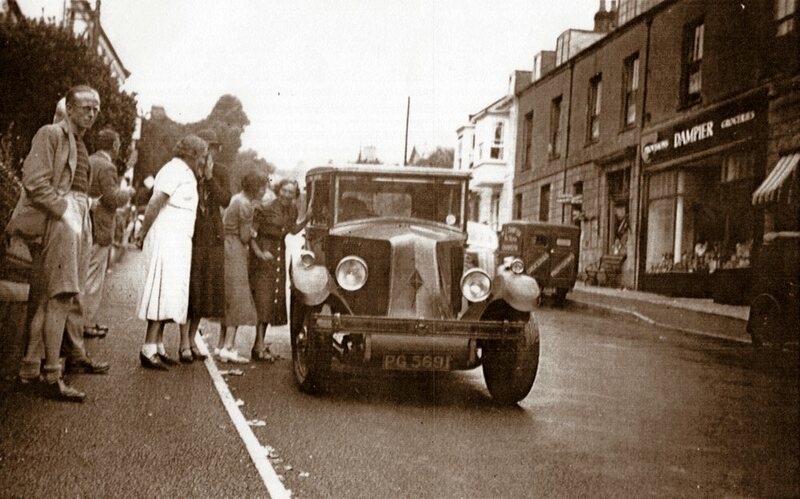 He took over the Axminster Bus from William Holly and started the first Motor Bus. 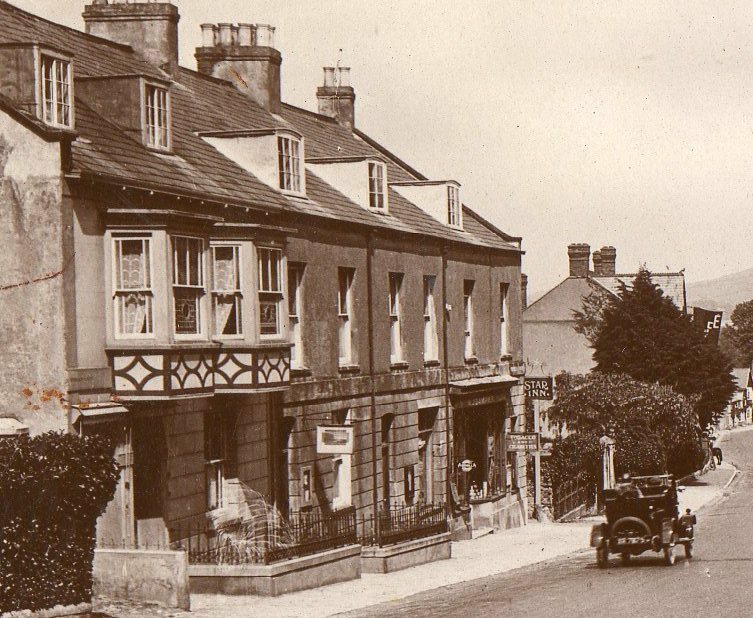 1911 Census leaves out Charmouth Stores as no one is living there at the time, but Mrs Thorne ia showing living at Ashyford House.Robert Morgan, Perrott and sons are shown as Grocers. 1911 Census shows William John Dampier (aged 33) living with his wife, Laura (nee`Pinnick) (aged 33) and their 11 month old son, Edward George at 20 Sydney Terrace Dorchester. He describes himself as Clerk (Grocery). It also shows that they were married in 1905. He originated from Stonehouse in Plymouth and his wife from Dorchester. G.K. Chesterton`s Story of "The Good Grocer" he gave to William Dampier and still in the families possession. Close up of New Shop Front. 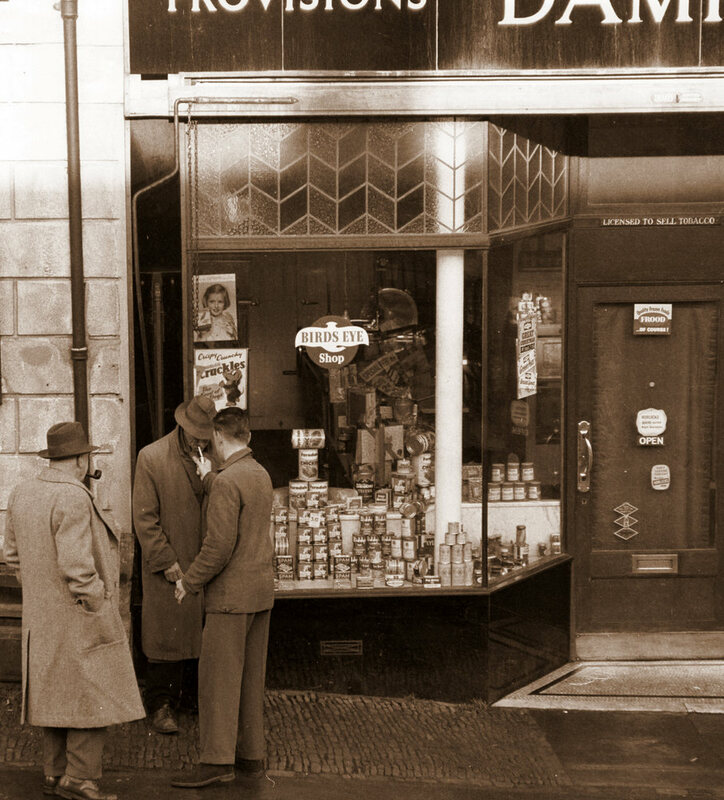 An early photograph of the shop window piled high with cans of fruit and soups. Donald is seen here filling up his apple display at the front of the shop. 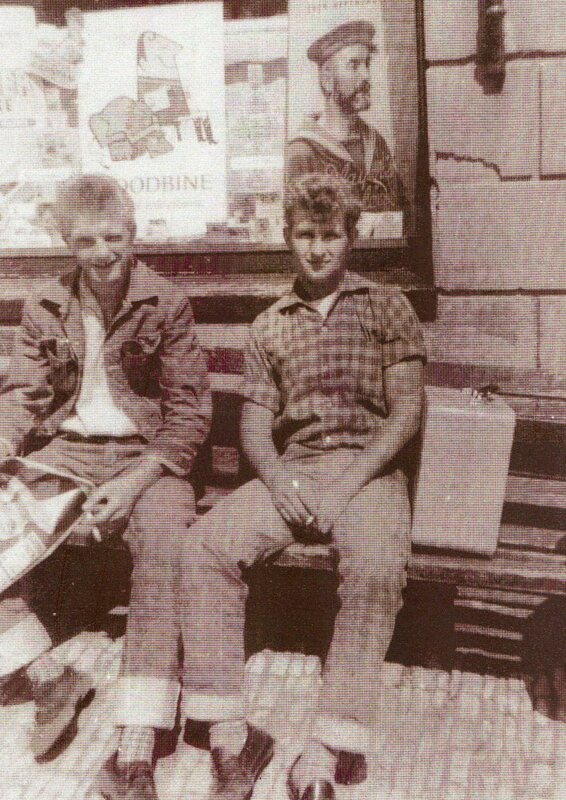 Noel Frampton and Dave Spurdle outside Charmouth Stores. Ron and Jean Dampier in their shop. 1961 Electoral Roll showng Donald and Gladys with son Ronald Dampier.at The Stores. 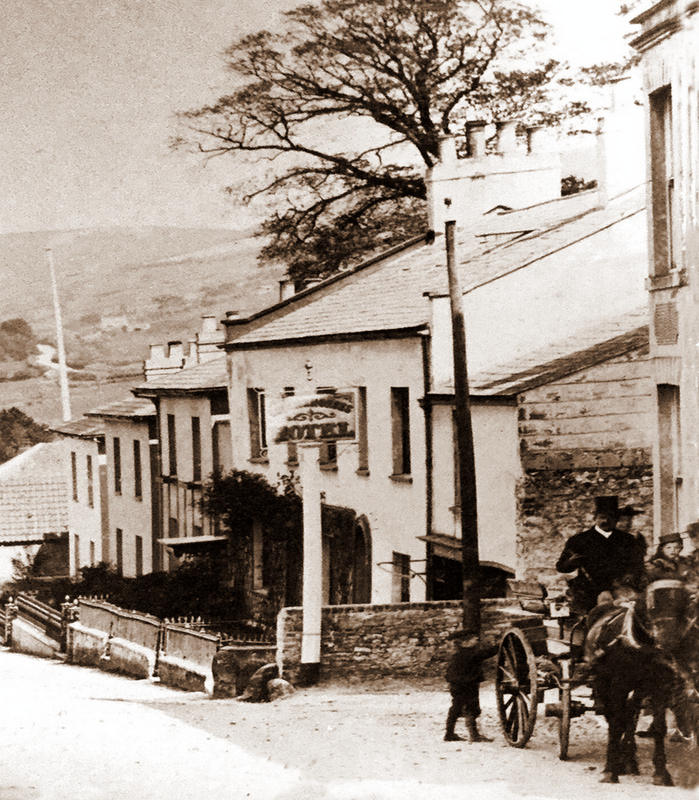 The Star Inn can be seen in the background of this photograph. 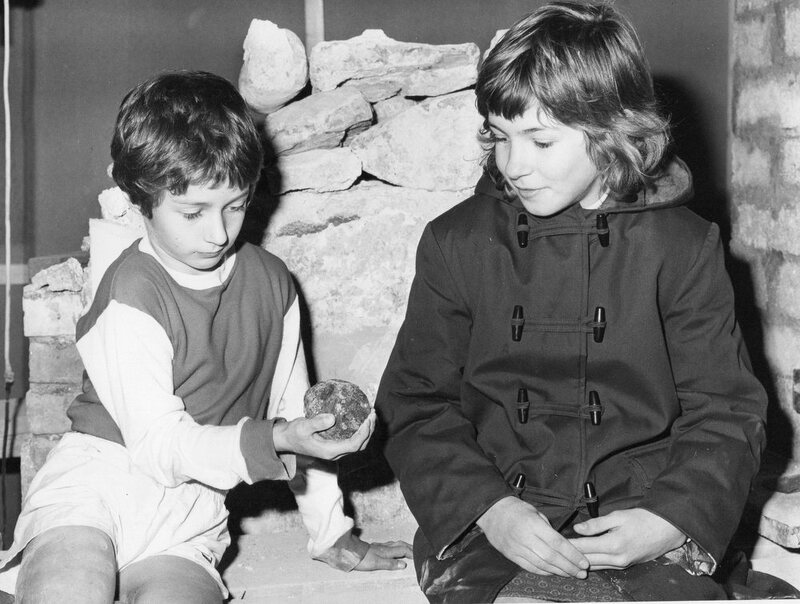 Ron and Jeans children with the cannon ball found in a chimney during restoration of the shop. 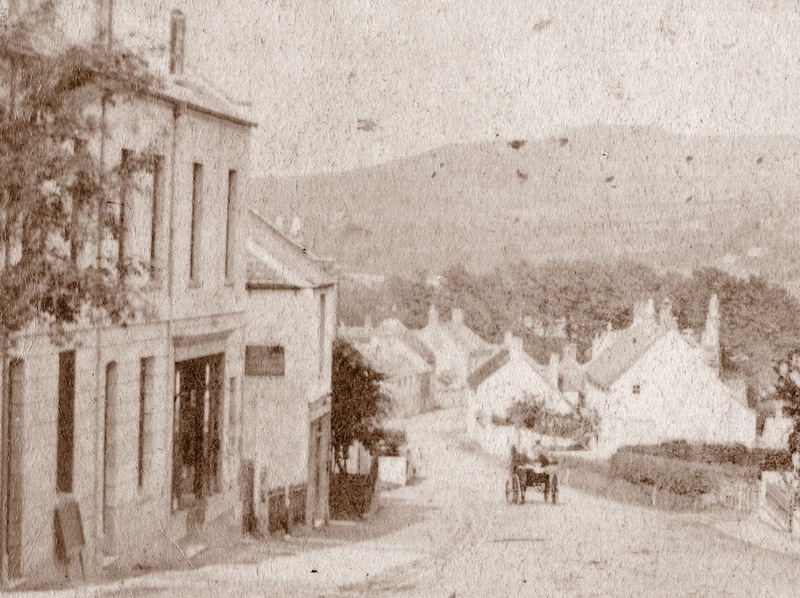 The Abbots House c.1895 when it was the Manse for the neighbouring United Congregational Chapel. A comparison with William dampier and his staff and family with Phill Tritton and their staff and family today. 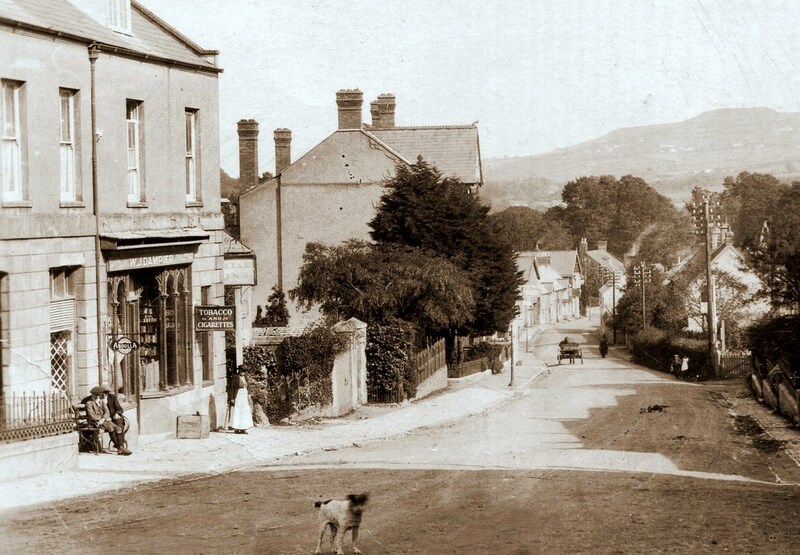 Breeze (the shop to the left of Charmouth Stores) today with its original Victorian Shelving.